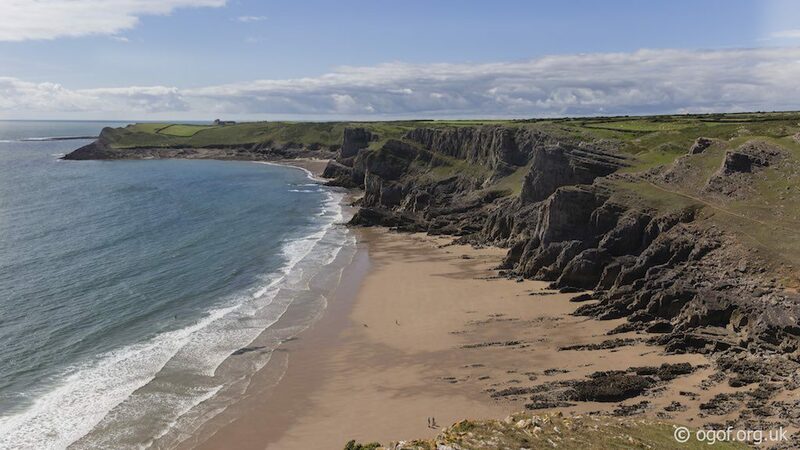 The South Gower Coast features stunning limestone cliffs that run the length of the southern coastline from Mumbles Head in the east to Rhossili in the west. The cliffs, bays, inlets and surrounding areas are rich in caves and are very accessible due to the coastal footpaths that run along this beautiful coastline. The vast majority of these caves are active sea caves or are remnants of such located in the upper cliffs from times of higher sea levels. 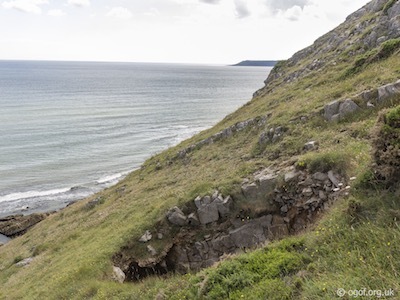 The abandoned sea caves in the cliffs have proved to be a rich resource for archaeologists, and virtually all have been excavated over the last century to provide a great insight into past climate and habitation of the Gower Peninsular. Many of these "Bone Caves " are very culturally significant and extremely well documented, although they provide little interest to the sporting caver. 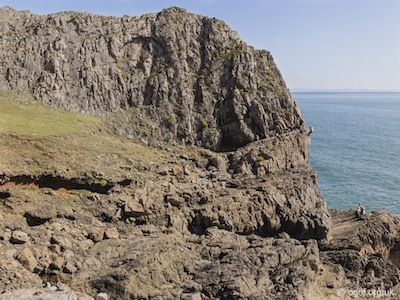 The caves are listed here in a roughly counter-clockwise direction from Rhossili in the west to the eastern extent of the limestone at Mumbles Head. The bone caves are generally located higher up in the cliffs where the recesses have been abandoned by the sea for millennia and have provided time capsules of past habitation, wildlife and in some cases burial sites. 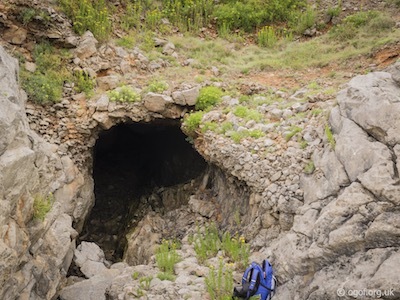 Many of the more significant sea caves are formed along vertical fissures, with active sea caves in the lower sections while further up in the tops of the fissures are the areas of abandoned sea cave which once contained the archaeological remains. Sea caves are included here, following earlier documentation in publications, both speleological and archaeological. There is a degree of inconsistency in the recording of these caves, which may in time be rectified. In areas of accessible cliffs around bays and beaches the sea caves are well documented along with ones that have been excavated by archaeologists. Where the cliffs are less accessible you will find that only the larger and more significant caves are recorded. 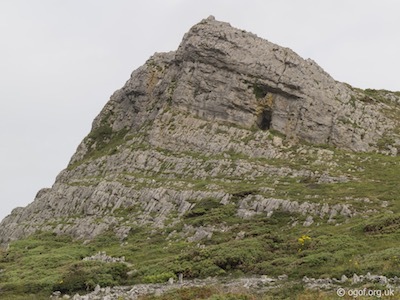 Heading from Rhossili to the Coastguard Station at Worms Head, the cave is located near the top of the headland, close to the cliff edge and about 800 m from the station. The entrance can bee seen from the path when approached from Rhossili. The cave is an open topped small chamber with stal on the walls and the floor shows signs of having been filled in. 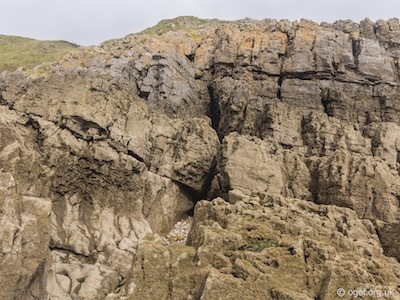 The cave is located at the foot of an outcrop on the steep slope of the cliffs, approximately half-way between the car park at Rhossili and the coastguard lookout station. The entrance is located at the top of a grassy slope that lies directly beneath the upper cliff. A calcite flow down the cliffs above the hole are a good indicator of the position of the cave. 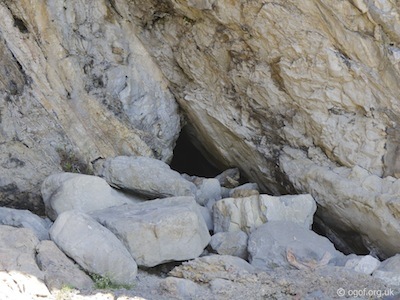 A drill hole for a Rawl bolt can be seen in the rock about a metre above the tiny entrance which can only be seen when you are right beside it. Access is gained to the cave down a very tight rift (ladder needed). At about 13 m there is a horizontal passage of mainly 60 cm to 2 m in height, well decorated, containing a couple of small pools. It follows the line of a fault inland for approximately 13 m and terminates in a 5 m deep pot, with a pool at the bottom. 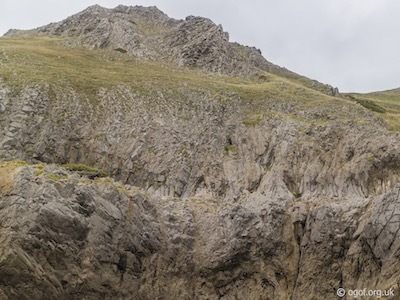 A continuation of the passage seawards consists of a chamber about 7 m long and about 1.5 m wide, with a scree floor which has run in from the surface down the rift. There would not seem to be any obvious way on at any place. 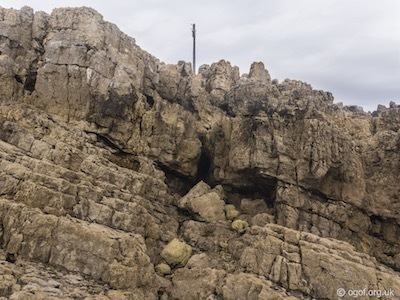 From the appearance of calcite formations on the cliffs above the entrance, it would seem that there was once a larger system which has subsequently collapsed. Located on the north side of the inner-head are two or three sites that were identified by Mel Davies. These sites are where voids between the bedding planes have left significant cavities. These fissures are approached by a bold traverse. 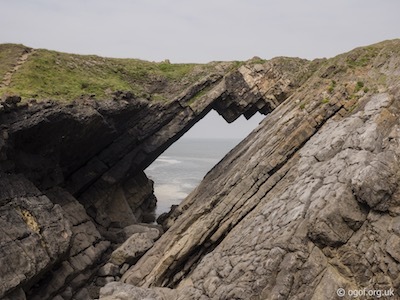 The Devil's Bridge is an impressive rock bridge that has been formed by the collapse of a sea cave. The rock bridge acts as dry link for the footpath on the first section of the Outer Head of Worms Head. 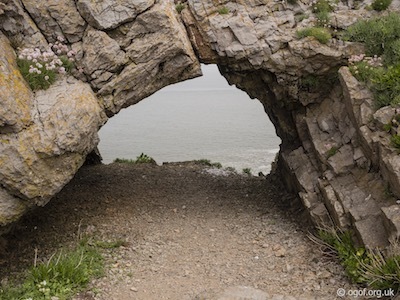 This fine rock arch, about 2 m high and as wide is located just to the north of the footpath that leads to the final section of the Outer Head of the Worms Head Peninsular. 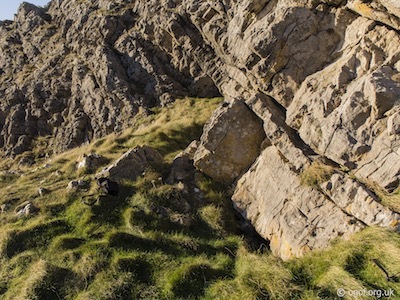 This short section of passage overlooks the steep cliff below and gives a fine view of Rhossili Bay. 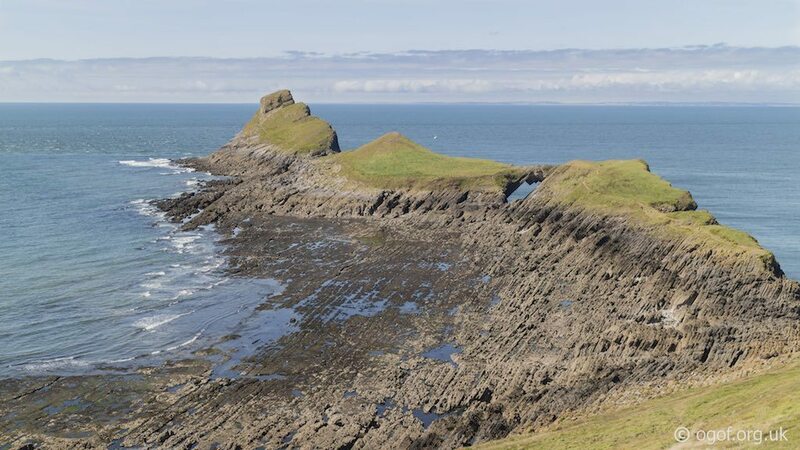 The final section of Outer Head of the Worms Head Peninsular is closed to visitors during the bird nesting season, so can only be visited from late summer. The blow hole is located on the north side of the footpath along final section of the Outer Head, where a sea cave is linked with a tight fissure on the top of the headland. 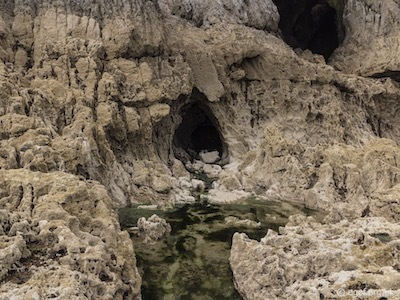 The blowhole is located on a patch of exposed limestone where a missing section of a calcite vein in the rock provides a small portal to the cave below. On very low tides in calm weather it is possible to enter the sea cave in a canoe between the swells. In conditions where there is a good swell on the sea, water can be seen from the headland shooting up from the blow hole. On the westerly face of the Outer Head a broad ledge dips down steeply to reach the sea on the southern side. Heading up along the ledge are two caves, the first is a small sea cave completely scoured out by the actions of the sea. The second - main cave is found a little further up and about 5 metres above the high water mark. The entrance, measures about 4 m in height and width, leads by way of a passage 9 m long and from 4 - 5 m wide to a square shaped chamber about 6 m across. On the right hand side and at the rear of this chamber is a low passage diverging at right angles. This extends for about 9 m and is from 1.2 - 2 m in width. This cave is an important archaeological site and have been extensively excavated, by E. C. Cunnington c.1912, then by W. Riches in 1923-24 and finally in 1989 by Mel Davies. Finds at this site included the burials of 1 adult and 1 juvenile and also an Upper Palaeolithic knife, flint, chert and rhyolite implements plus animal bones. On the westerly face of the Outer Head a broad ledge dips down steeply to reach the sea on the southern side. Heading up along the ledge are two caves, the first is a small sea cave completely scoured out by the actions of the sea. The cave can be accessed from the south for a short time on very low tides. The cave entrance is about 3 metres wide and 2 metres tall and ends after about 8 metres. The cave will be inundated by the sea on storm tides. 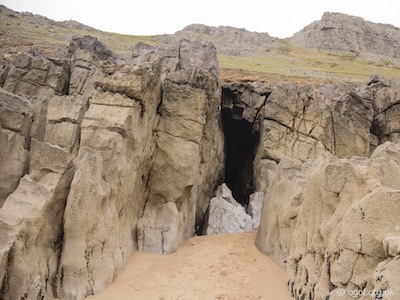 This cave is located in the 'Raised Beach' deposits on the western side of Fall Bay. The cave is found just beside the lower coastal footpath where a hole in the grassy bank just below the path leads into the top of the cave. The main entrance to the cave is located in the raised beach deposits in the cliff below and can be penetrated for about 3 metres. 'Lewes Castle' is a prominent rock headland located east of Worms Head and overlooking Fall Bay. On the western side of the headland a narrow, exposed grassy footpath is located between the lower and upper cliffs. 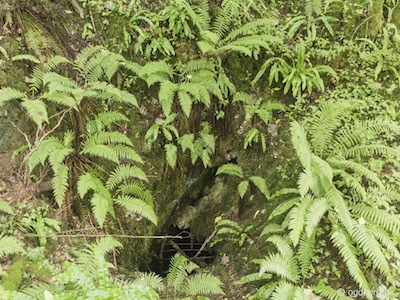 The cave has two entrances located just beside the footpath and hidden in vegetation in the summer. 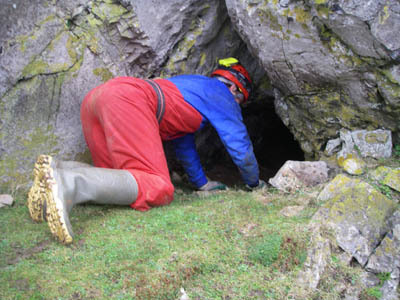 The cave was first discovered by Mel Davies in 1982 and as an archaeologist he excavated the upper level of softer infill in the cave entrances and inner chamber to find relatively modern remains of small animals including Sheep, Fox, Rabbit, Birds, Pig, Mole, Field Vole and shells. The site was recorded and a low infilled passage leading off the inner chamber noted. The first entrance is about 50 cm tall, while the second one is about 1.5 m tall, they are spaced about 4 m apart and lead to the low inner chamber, which has a low passage leading off. In 1985 a group of London cavers from Marisia's Caving Club started to excavate the low inner passage and dug out some of the more compacted clay infill. The passage was believed to be 3 m tall, filled to about 30 cm of the roof. The cavers excavated about a further 30 cm of infill to make progress along the passage. The group found Pleistocene fauna within the spoil that they removed which was later identified by A. Currant of the British Museum (Natural History) as comprising Hyena, Wolf, Mammoth, Woolly Rhinoceros and Reindeer. The group realising the archaeological importance of the site then voluntarily suspended their digging operations. The remains that were uncovered in their exploration are now believed to be in possession of the National Trust. 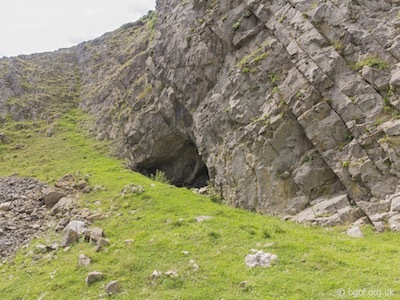 This site is referred to as Boulder Cave in caving records by Oldham and Rutter but is marked on OS maps as Giant's Cave, by which it is know to by locals and climbers. 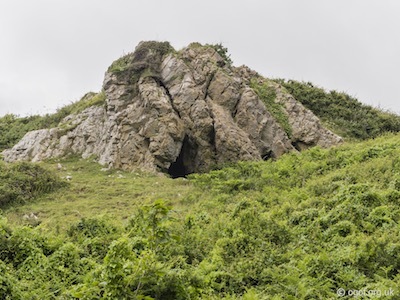 The cave is located at the east end of Fall Bay between the two rock promontories of Lewes Castle and Devil's Truck. The cave can be accessed for about 2 ½ hours either side of high tide. 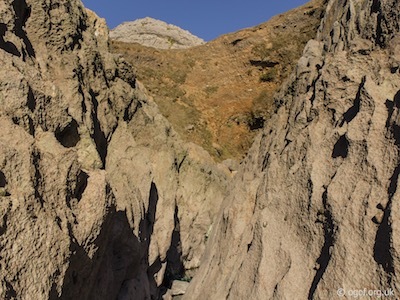 The portal of the cave and surrounding cliffs contain a number of challenging routes, popular with local climbers. This large sea cave has a massive rectangular entrance which is 13 m wide and up to 13 m tall and has a very large boulder in the middle of the entrance. 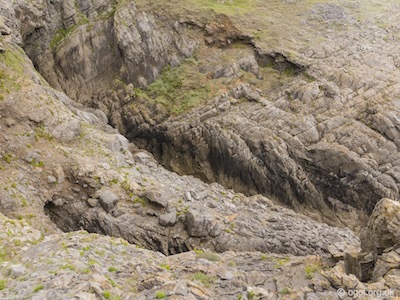 This boulder floored cave closes down after 20 metres. This cave is located on the west side of the Devil's Truck promontory. 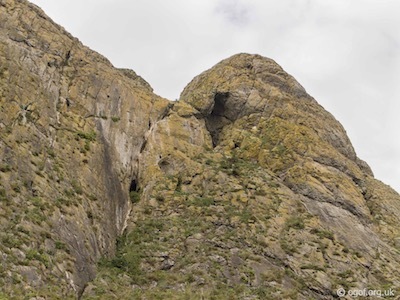 The cave is found on a prominent rock ledge that provides access for climbers and adventure groups. The cave is about 1.5 metres high and 2 metres wide and blocked with clay after a short distance. 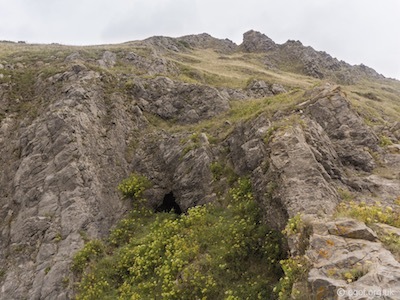 This cave is located in the upper cliffs between Lewes Castle promontory and the Devil's Truck promontory. The cave is found 2 metres from the top of the cliff on a prominent rock ledge. The cave entrance is about 1.5 metres wide and 50 cm tall and can be seen to extend for a few metres. 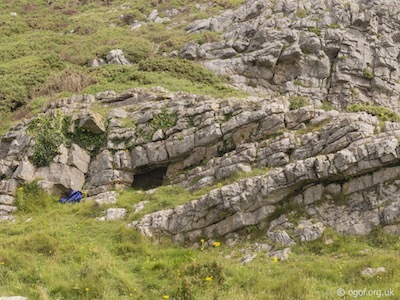 This cave is located in the lower cliffs between Devil's Truck promontory and the Jacky's Tor promontory. The cave is found halfway up the cliff. The cave entrance is about 2 metres tall and 50 cm wide and can be penetrated for 2 metres. The cave has a red clay floor. 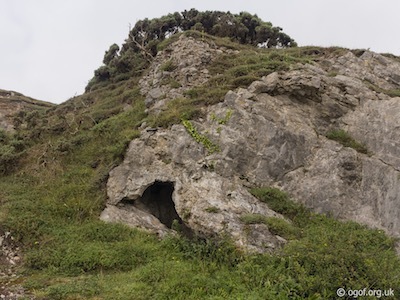 This cave is located on the west side of Jacky's Tor promontory facing the sea. 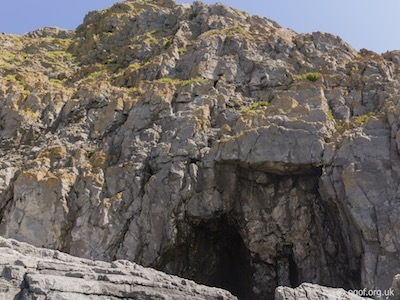 An 8 m climb up reaches the large circular entrance to this sea cave which is located at the high water mark. 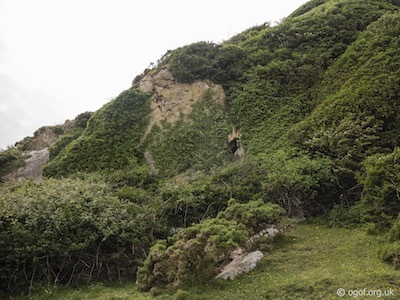 This is one of three small caves in the lower cliff of Mewslade Bay on the east side of Jacky's Tor. They are located on a 'raised beach' platform which forms a prominent ledge. The caves are visible from the beach at low water, and can be reached by a short climb. This is the smallest of the three and is about 6 m west of Cave A. This contains remains of a 'raised beach' conglomerate and traces of overlying deposits. This is one of three small caves in the lower cliff of Mewslade Bay on the east side of Jacky's Tor. They are located on a 'raised beach' platform which forms a prominent ledge. The caves are visible from the beach at low water, and can be reached by a short climb. This is the central cave and is about 3 m west of cave A. The cave is the most interesting of the three with a substantial accumulation of 'raised beach' materials on the floor and other deposits adhering to the walls. This cave was excavated in 1982 by Dr. D. H. Malling who found the remains of a Bear consisting of a canine and a humerus fragment. This is one of three small caves in the lower cliff of Mewslade Bay on the east side of Jacky's Tor. They are located on a 'raised beach' platform which forms a prominent ledge. The caves are visible from the beach at low water, and can be reached by a short climb. This, the largest and easternmost of the three caves has an entrance that is 3 m wide and about 7 m tall. The cave has a floor of fallen blocks and extends for about 13m in length. This is one of series of more significant sea caves located near the entrance to, or along the western side of Mewslade Bay. The bay can be accessed from the small village of Pitton where a pleasant 800 metre walk down the valley from the car park gives access to this splendid beach. This is the most westerly of the sea caves in this bay and contains a pool near the entrance. 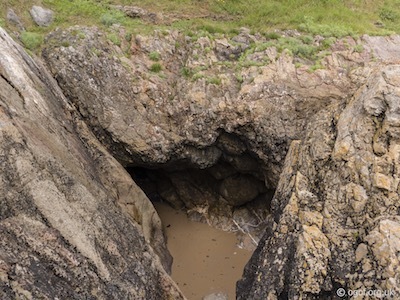 This is one of series of more significant sea caves located near the entrance to, or along the western side of Mewslade Bay. The bay can be accessed from the small village of Pitton where a pleasant 800 metre walk down the valley from the car park gives access to this splendid beach. This cave has a fallen boulder located in the 3 m high entrance which retains a shallow pool. Further in the cave is a second pool just over 1 m deep, beyond which the sand floor gives way to pebbles. The passage becomes impassable after 22 metres. This is one of series of more significant sea caves located near the entrance to, or along the western side of Mewslade Bay. The bay can be accessed from the small village of Pitton where a pleasant 800 metre walk down the valley from the car park gives access to this splendid beach. This cave has a 7 m high rectangular entrance which leads to a passage that ends after 10 metres. This is one of series of more significant sea caves located near the entrance to, or along the western side of Mewslade Bay. The bay can be accessed from the small village of Pitton where a pleasant 800 metre walk down the valley from the car park gives access to this splendid beach. This is a short cave is located on the west side of the entrance to the bay. The cave is rock arch about 5 m long and 1.5 m tall. This is one of series of more significant sea caves located near the entrance to, or along the western side of Mewslade Bay. The bay can be accessed from the small village of Pitton where a pleasant 800 metre walk down the valley from the car park gives access to this splendid beach. This is a short cave is located on the east side of the entrance to the bay. 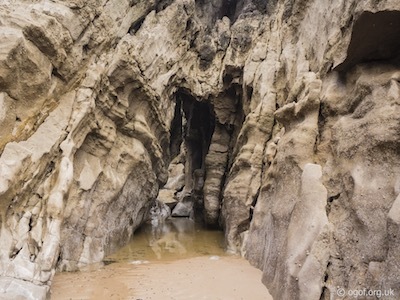 The cave is rock arch about 5 m long and 2.5 m tall with a small stream flowing through it. Towards the bottom of Mew Slade, just before the bay is reached lies a rock promontory to the east of the wall and footpath. The cave is located at the base of the exposed rock face, on the western side and facing the sea. The entrance is a rift passage about 2.5 m tall. This becomes narrower until a junction is reached. To the right is a higher keyhole passage about 2 m long, filled with mud and ends at a mud choke. The way on into the cave is to the left where after 5 m a tight and steeply descending tube leads to a 3.5 m deep pot. The pot has hand and footholds, but the tight and twisting nature means that a handline is very useful on the return. At the bottom of the climb a short tight passage ends in an impenetrable squeeze. Towards the bottom of Mew Slade, just before the bay is reached lies a rock promontory to the east of the wall and footpath. The cave is located in the exposed rock face, towards the top and facing the sea. This cave is a rock shelter about 2 m tall and 3 m in depth, with some of calcite covering areas of the wall. Towards the bottom of Mew Slade, just before the bay is reached lies a rock promontory to the east of the wall and footpath. The cave is located in the bottom of an exposed rock face, facing up the valley about 65 metres from the bay. The entrance is about 1.2 m wide and high and leads to a 4 m crawl, ending at a choked pot. To the right is an extremely tight squeeze in the roof which leads to a small chamber about 1.5 m long. 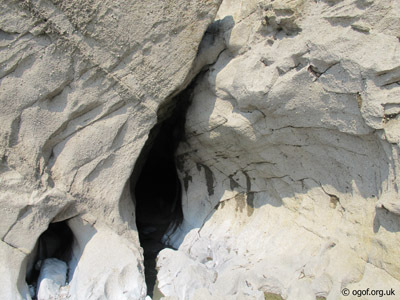 Four metres above the cave, and also to the right of the entrance are two small cavities which look insignificant. In 1914 E.C. Cunnington excavated the cave and found indications of human occupation which included a worked Neolithic flint. 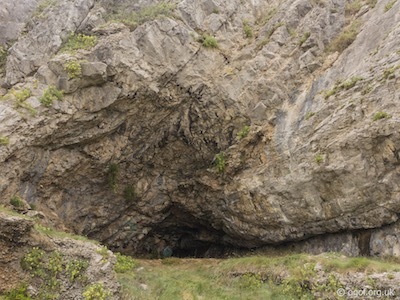 The cave is situated in an isolated outcrop called Richard's Rock about half way down Mew Slade on the east side of the valley about 15 m from the track. There cave is located about 12 m south of Mewslade Rock Cave, and about 5 m up the rock face. The entrance is small, 60cm high by 45 cm wide and hidden in vegetation. This leads to a winding tube which may be followed for about 4 m when it becomes too tight for further progress. A second entrance beyond the constriction is impenetrable. 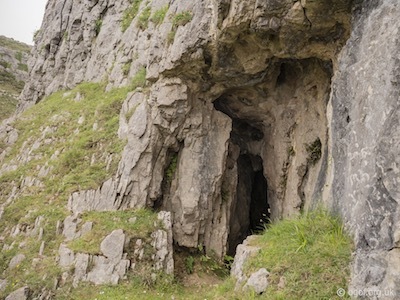 The cave is situated in an isolated outcrop called Richard's Rock about half way down Mew Slade on the east side of the valley about 15 m from the track. There are 2 entrances, 60 cm apart and 1.5 m up the rock face. The left hand entrance measures 1.2 m high and 90 cm wide whilst the right hand entrance is 1 m high and 90 cm wide. The passage closes down rapidly to a tight squeeze after 5 m. The way on can be seen but is too tight for further progress. This cave was explored by "The Taylors" and originally named Cliff Hole by Clague Taylor. 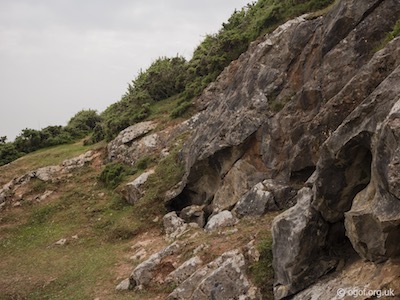 The cave is located on the west side of the footpath down Mew Slade in the next rocky outcrop south of Mewslade Quarry Caves. The entrance is located about 2 m up a rock face which is partially covered with ivy. The entrance is about 1 m high and 50 cm wide and leads via a short crawl to a junction. The passage on the left is too tight but straight ahead a 4 m high chamber can be entered via a squeeze. From the junction a climb down to the right leads to an alternative route into the chamber passing a low choked passage on the left. At the far side of the chamber 5 m of passage ends in an impenetrable constriction. 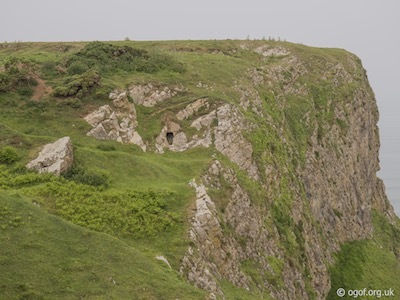 This is one of two caves that were known as Mewslade Quarry Fissures in early literature and are located very close together in a small disused quarry. 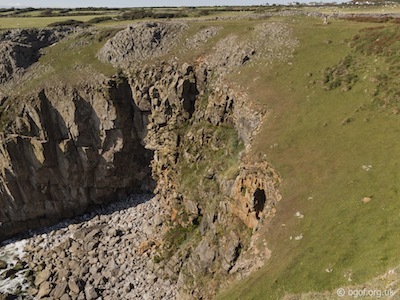 The quarry is found to the west of the footpath that heads down Mew Slade, just after you pass through the gate that marks the start of the National Trust property. The two most northerly entrances in the quarry both lead into Cave 1. 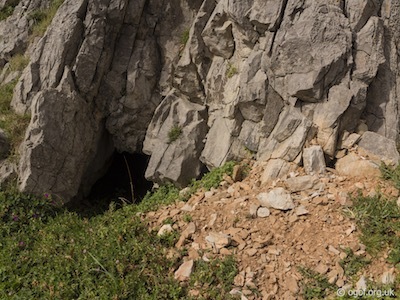 The 60cm high entrance on the left provides the best access to the cave as the other is very tight. The entrance passage is about 1 m in height and after about 13 m reaches a 3 m deep pot. This pot was dug by "The Taylors" in 1958. At the top of the pot a passage on the left brings you to a junction after about 7 m of winding crawls. 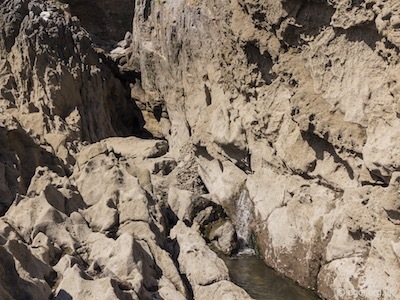 Ahead is too tight, but a by-pass window on the left followed by a flat-out squeeze gives access to an ascending rift passage, where it is possible to stand, and terminates in a boulder choke. Returning to the 3 m deep pot which may be free-climbed, a passage down to the right is impenetrable but ahead a spacious passage ascends in a series of steps to terminate about 12 m from the pot in a boulder choke very close to the surface. Much of the cave comprises crawls in phreatic passages. Most of the formations have been destroyed, but there are some pockets of white and brown moonmilk. 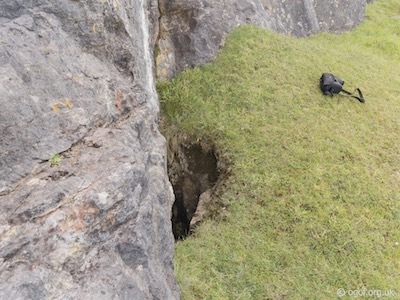 This is one of two caves that were known as Mewslade Quarry Fissures in early literature and are located very close together in a small disused quarry. The quarry is found to the west of the footpath that heads down Mew Slade, just after you pass through the gate that marks the start of the National Trust property. 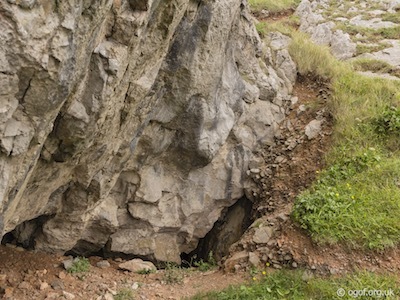 The most southerly entrance in Mewslade Quarry leads into Cave 2. The 60 cm high descending keyhole passage leads, after a short distance to the 8 m long main chamber with passages leading off from the near left hand corner and the far right hand corner. Ahead the cave terminates in a choke after 3 m. The passage on the left of the main chamber takes the form of a steeply descending 2 m high winding canyon, nicely waterworn, to a small chamber beyond which the passage continues as a low crawl terminating in a mud choke at a junction with a cross rift. 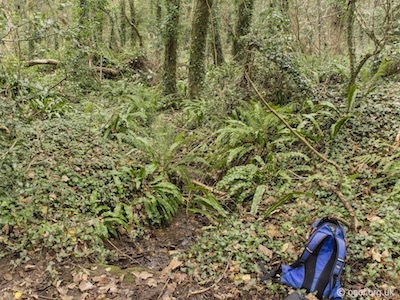 The passage to the right of the Main Chamber is a winding, rift-like abandoned stream passage which closes down abruptly after about 10 m to end in a mud choke just beyond a short tributary passage which is similarly blocked. 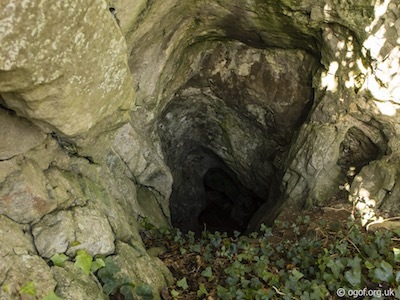 The cave is located in a small, private sycamore wood to the west of the footpath that heads down to Mew Slade. The main entrance is 2 m high x 2.5 m wide and faces south. The cave has been blocked by rubble. An archaeological dig revealed mussel shells and human and animal bone fragments. There are numerous other small water worn cave openings in the adjacent cliffs, but none are accessible. At the top of Mew Slade is the small hamlet of Pitton, situated on a crossroads. Located a short distance up and to the east of the northern road is Pitton Swallet, a significant sink situated at the end of a blind wooded valley opposite Gable Farm. This was discovered by Nigel Burns in 1974 of the Cotham Caving Group. A 3.5m deep pothole was excavated in 1975 to reveal a short passage leading off. A few metres upstream is Upper Pitton Swallet. A short tight 'S' bend pot leads to a chamber 1.6 m in diameter. The way towards Pitton Swallet can be seen but is too tight to enter. 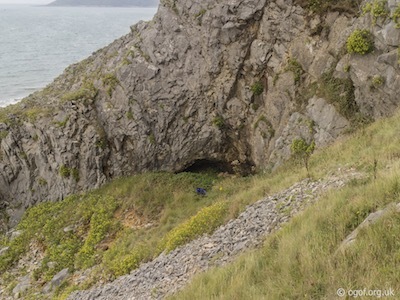 The cave is located near the top of the headland to the east of Mewslade Bay. 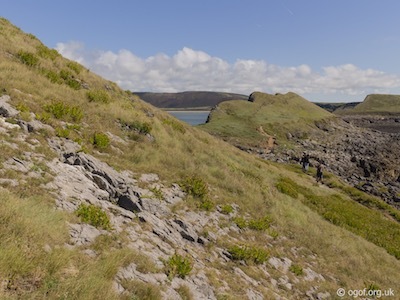 The site can be accessed via the costal footpath or by climbing up from Mewslade Bay itself. This rock shelter faces west, with an impressive view over the bay. The cave is three metres wide, a metre high, and up to two metres deep. 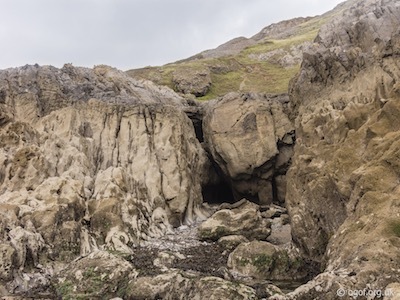 The cave is located to the east of Mewslade Bay in the base of the sea cliffs and can be visited as soon as the tide has receded from the cliffs. 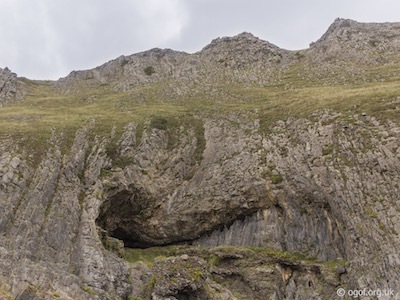 There are three horizontal entrances and two unnegotiable vertical ones, the latter caused by the collapse of the cave roof. There are some fine crystals of dogtooth calcite on the left of the main entrance and some flowstone on the right hand wall beside the east entrance. 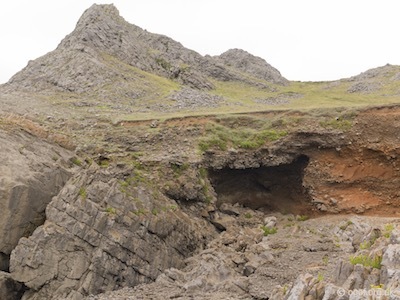 The main (middle) entrance is at sea level and is 4 m high but the cave is best entered via the smaller entrance to the east which lies just above the normal high water mark. All entrances lead directly to the spacious 18 m long main chamber which has a pebble and boulder floor. In the far right hand corner of the main entrance of the main chamber a short climb leads to a small chamber with some brown formations. From here a flat-out squeeze leads to another small chamber and a short muddy ascending corkscrew passage also containing some small speleothems. The inner reaches of the cave do not owe their origin to sea action, indeed the sea only penetrates here in exceptional conditions. 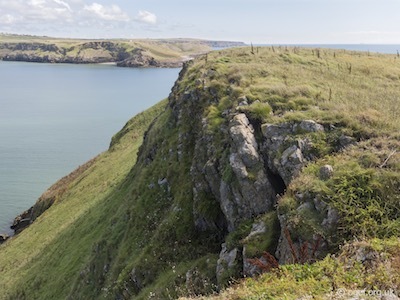 The cave is located in the shallow valley behind the cliffs just above Red Chamber and is best approached via the coastal footpath heading east from Mewslade Bay. The cave is a rock shelter 2 metres wide and 1 metre high, going back a little over a metre with a rocky floor. Mel Davies found a flint implement in the cave in 1984 and returned in 1985 to excavate the floor in about half of the cave excavating to a depth of 30 cm. Davies found fragmentary evidence of human fibula and femur indicating at least one burial at the site along with animal remains comprising of Ox, Sheep Goat, Badger, Limpet and Mussel shells indicating a habitation midden. 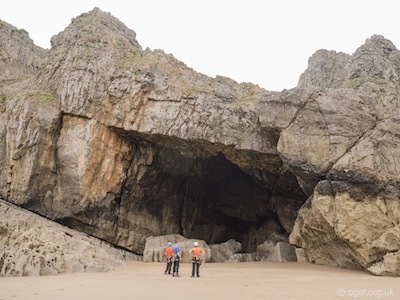 The cave can only be entered at low tide and is best approached heading east along the coastal footpath from Mewslade Bay. The cave is located in the head of a small rock floored bay. The large 15m high entrance gives access to a spacious chamber 10 m wide with pebble and boulder strewn floor and a wide calcite vein in the roof. The chamber gradually closes down to terminate abruptly after 40 m where it is 2 m high and 3 m wide. Here a short climb up the right hand wall leads to a 22 m adit driven during the last century in search of lead. The adit averages 2 m high and 1 m wide and terminates in a flooded shaft and a collapse near its entrance has resulted in the formation of a small chamber. The flooded shaft was dived in 2015 and found to be blind at just under 2 m depth. The miners' search for lead was unsuccessful but red ochre was commercially extracted and traces of it are still visible in parts of the cave, particularly on the western wall of the cave. The cave is located on the eastern flank of the shallow valley behind the cliffs just above Red Chamber. 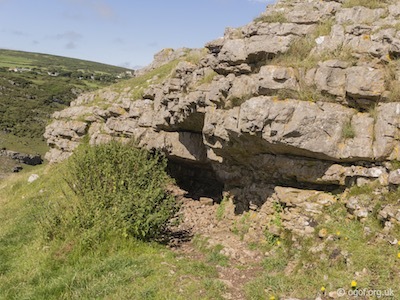 The cave is best approached via the coastal footpath heading east from Mewslade Bay and the west facing entrance can be clearly seen. The cave is a rock shelter three metres wide and just over a metre high, going back a little over three metres. The floor in the front section of the shelter is grassy with a stoney floor near the rear. 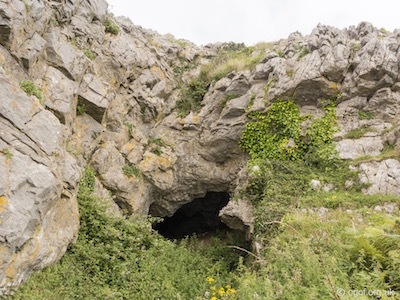 The cave is located near the head of Ram Grove and is located in a steep rock face just below the coastal footpath. 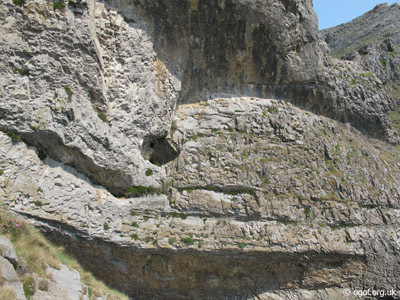 The entrance is about three metres wide and a metre high, sloping steeply with the beds of the limestone. The descent to the cave is steep and through thick vegetation and was not entered by the author. This site is located on the east side of Ram Grove Bay just below the high water mark. At this location water resurges from fissures in the rocks and first flows into large rock pools before flowing down to the sea. The site was first recorded by Mel Davies who reported removing rocks to try and follow the source of this freshwater. 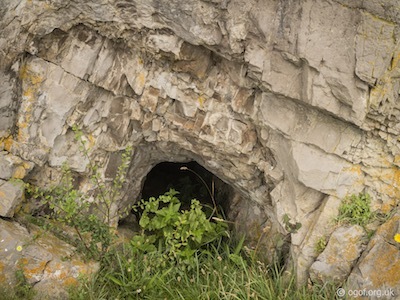 This cave is located about 8 metres from the top of the upper cliff just west of the Knave Promontory Fort. The triangular entrance is about two metres high and a metre wide at the base. The cave roof meets the floor after about two metres. The cave is located on the west side of the Knave. Heading down the footpath beside the wall a steep grassy ledge is found on the west near the point the wall ends. 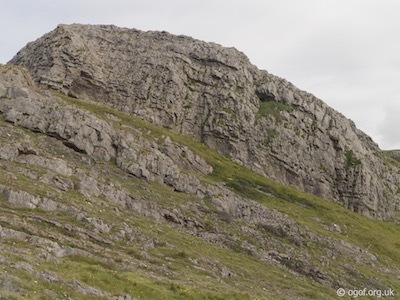 The grassy slope is reached via a short climb up and a short traverse around the top of a scree slope. The cave is located about halfway up the grassy slope in the base of the cliff. The small triangular entrance is about 80 cm high and leads into a low crawl over a clay floor that can be followed for about 14 metres. The cave has been dug and extended at some point. The cave is located on a steep slope above the Knave, from which it takes its name. The cave was discovered in 1982 during a search for bat roosts. The cave was explored and found to contain some fragments of Bronze Age pottery. Later in 1984 a flint scraper was also found in the cave, just under the entrance arch. Ogof Ffynnon Wyntog or Deborah's Spring as it was originally named is a site with a long history of exploration. A short section of cave passage leads to a sump from which the water emerges. The spring issues a steady flow of water through most of the year, but at the end of long dry summers the flow may stop and the sump level falls to allow entry. Originally a large boulder blocked the way on the far side of the sump, but this was removed to reveal a further sump and then passage beyond. The cave has been explored and extended in several phases. 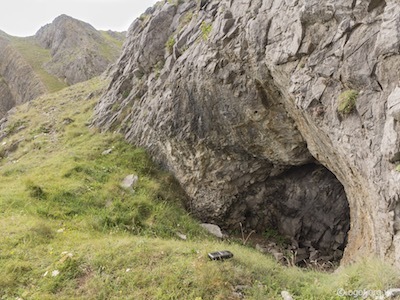 This cave entrance is located in the cliff of the Knave overlooking the resurgence of Ogof Ffynnon Wyntog. The entrance can be reached by a bold traverse or by climbing up the bolted route to the entrance. The large entrance leads to a tight descending passage. 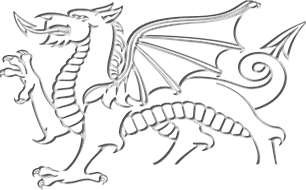 Ogof Wyntog has also been referred to as under a series of different names over the years. 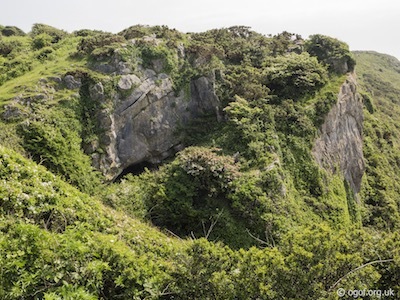 It was first recorded as Cunnington's Cave, named after Ned Continuing a young man from a family of archaeologists that often visited the Gower. Two worked stones were found by the family (probably in this cave). After the death of Ned in the First World War an inscription was left in the cave which read as follows..
" This cave – a secret by the family shared – was bequeathed to it by Ned Cunnington who first, alone, it’s dark entrance had dared in nineteen nine now twenty years gone, that many secrets of the earth be hid it does sufficiently and well expound. Let others – as he, depths and darkness did – go forth, explore into the dreadful ground. To us this cave is sacred to the name of him who, we believe, first entered it, who was liked well and – at his very prime – who to fight in the great war and fall in it and we would have this grandly entranced cave unimpaired, fitting monument.... grave..... cave..... "
This was reported in 1964 in the South Wales Evening Post. The cave has also been known as Cwtch Cave and Deavon (a corruption of Devon) Cave. The cave is located at the Knave, with a large sea cave entrances that links to a series of passages with a smaller entrances located in the slopes above the bay. The cave is of phreatic action and not formed by the sea, apart from one section where the two caves have connected. On the slopes above the Ogof Ffynnon Wyntog resurgence are the small entrances to the upper section of cave. The two small entrances link and lead to a low descending passage to join with a long narrow chamber where you can now walk. From the chamber a sandy passage leads off to the left over dried gours to reach a point after about 25 metres where you can see a drop down into the roof of the sea cave. A ladder would be needed to descend here. Back at the end of the long chamber the passage continues ahead via some crawls and squeezes to reach a second chamber with two ways off. From the chamber a low passage leads for nearly 30 metres to reach Bone Chamber where archaeologist have found Ox bones, this chamber appears to be close to the surface. Back at the second chamber the main way leads ahead with daylight indicating the route down a calcited slope where entry to the Ogof Wyntog Sea cave can be made. This cave is located at the Knave with the large entrance five metres wide and over ten metres high being accessible at low tide. This sea cave entrance is connected to the above cave. The two caves will have formed separately and connected as the sea cave invaded the cliff. 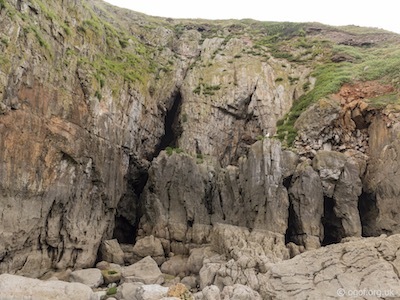 This sea cave is located in the cliffs at the Knave between the Ogof Wyntog Sea cave entrance and the Ffynnon Wyntog rising further up the bay. 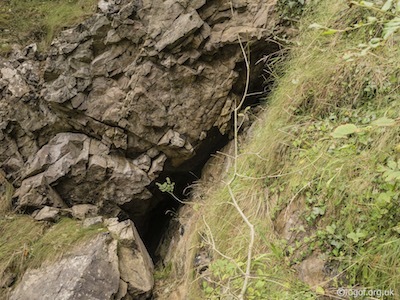 The cave runs back into the cliff for about 20 metres passing below but not connecting with Ogof Wyntog. Approached from the coastal footpath the route down the gully is taken towards the Knave. At the point the wall that runs down the gully ends you should ascend the east side of the gully to reach this rock arch sat on top of the headland with a spectacular view overlooking the Knave. The rock arch is about a metre tall and two metres in length. Approached from the coastal footpath the route down the gully is taken towards the Knave. At the point the wall that runs down the gully ends, you should ascend the east side of the gully to reach the rock arch sat on top of the headland. Then descend heading east to reach a grassy ledge that can be followed down dip to a series of three caves, the first being this small cave entrance that appears to have been dug recently (2016). 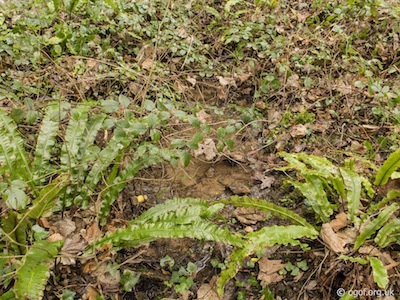 The entrance is about 50 cm wide and can be seen to close down after a short distance. Approached from the coastal footpath the route down the gully is taken towards the Knave. At the point the wall that runs down the gully ends, you should ascend the east side of the gully to reach the rock arch sat on top of the headland. Then descend heading east to reach a grassy ledge that can be followed down dip to a series of three caves, the middle of the three caves is Deborah's Hole with a small unassuming entrance in the solid rock of the cliff. The small entrance faces the sea and is about 40 cm wide and about 60 cm tall. The entrance crawl leads to a small chamber after about 5 m. The chamber is about 3 m long x 2 m wide and over 3 m in height with two ways off that are two tight to enter and close down after about a metre. There is also a 'chimney' on the left of the entrance passage with a small opening on the cliff. The floor of the passage and chamber is covered with red cave earth. The cave was excavated by Colonel Wood in 1861 but his findings were not published, however his finds from the cave were donated to the Royal Institution of South Wales. The finds included bones from the following species: Bear, Wolf, Hyaena and Soft Nosed Rhinoceros. There was also evidence of human occupation including a bone-pin, bone with a groove and a non-worked flint blade. Approached from the coastal footpath the route down the gully is taken towards the Knave. At the point the wall that runs down the gully ends, you should ascend the east side of the gully to reach the rock arch sat on top of the headland. Then descend heading east to reach a grassy ledge that can be followed down dip to a series of three caves, last of the three caves is Deborah's Cliff Shelter now known as Ogof Asgwrn Mochyn after pig bones found during excavations. The cave is a classic rock shelter with an arching roof that is over 3 m wide at the base and nearly 2 m high. The shelter faces the sea and leads back over a stoney floor for about 3 m to meet a crevice that heads back for about 7 m into the cliff. The cave was first noted by J.G. Rutter in his survey of the local caves in 1943, noting that it has already been excavated by persons unknown. The site was later excavated in 1983 by Mel Davies and the Cwmbran Caving Club who found bones from the following species: Pig, Sheep/Goat, Hare, Mole, Frog, Fish and Birds. The cave is approached from the coastal footpath and is reached by descending the un-named slade to the west of Foxhole Slade. The cave is situated 15 metres above the floor of the slade with an easy scramble up sloping rock to reach the entrance, but above it the cliff becomes vertical, and it is only some 18 metres below the cliff top. The cave entrance consists of a small solution passage facing north west, about 1.2 metres high, 1.2 metres wide, which immediately narrows to 60 cm under the ceiling but only 30 cm at floor level. It becomes too low for progress within 3 metres. There is a flat, horizontal, clay floor, used by animals. 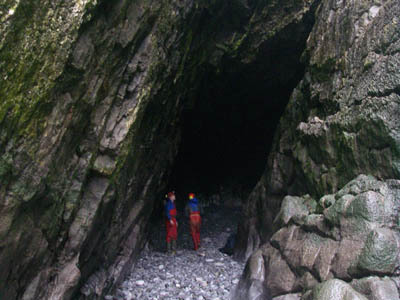 The cave is approached from the coastal footpath via Foxhole Slade where two routes are possible depending on the tides. It is best approached at a low tide where for a very short window of time you can head down the east side of Foxhole Slade to drop down onto a narrow section of beach. Then heading west past the mouth of the sea cave and climb up towards Paviland Cave. An alternative route which is essential outside a short time around low tide is to head down the west side of Foxhole Slade and take an exposed traverse around the cliffs to the south facing cave entrances. The cave is very dangerous to approach at high tide. 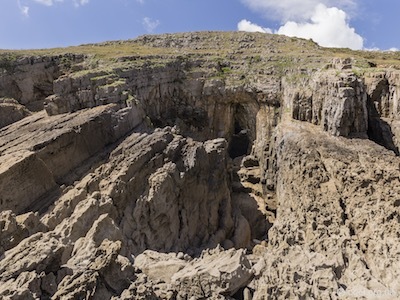 The entrance is about 50 metres west of Paviland Cave and at approximately the same height above the sea. It can be approached from the latter by a rough scramble over the rocks. The cave is about 30 metres in length with a floor partly covered with pebbles. It was beneath pebbles that an excavation by the Rev W.Buckland found animal remains. These belonged to at least four species: Bear, Deer, Ox and Horse. 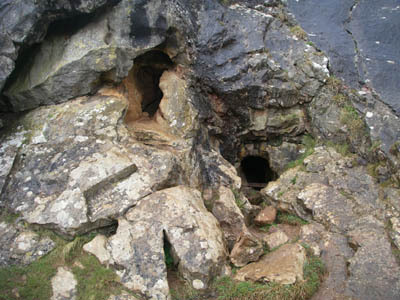 The cave is approached from the coastal footpath via Foxhole Slade where two routes are possible depending on the tides. It is best approached at a low tide where for a very short window of time you can head down the east side of Foxhole Slade to drop down onto a narrow section of beach. Then heading west past the mouth of the sea cave and climb up towards the large cave entrance. 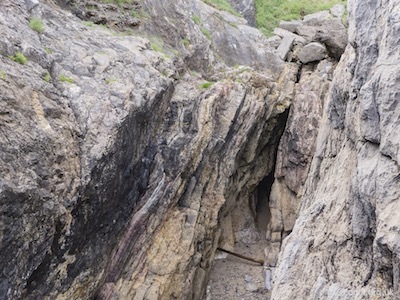 An alternative route which is essential outside a short time around low tide is to head down the west side of Foxhole Slade and take an exposed traverse around the cliffs to the south facing cave entrance. The cave is very dangerous to approach at high tide. The pear-shaped entrance is about 10 metres high and the inner passage roughly 5 metres wide, ending after about 22 metres. A chimney leading up to an opening some 20 metres higher allows a pool of light to enter the cave. 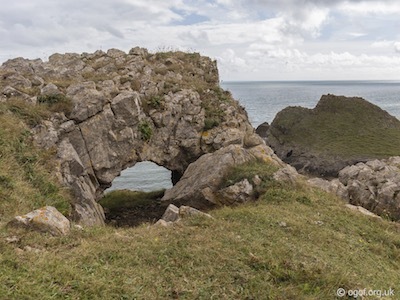 The cave would have been inhabited around the last Ice Age, when the sea would have retreated and the cave looked out over a vast plateau that ran across to Devon. The first recorded exploration of the Paviland Cave was undertaken two local brothers, J. Davies and D. Davies in 1822. Their finds included the tusk of an elephant. This led to further discoveries by Miss J. Talbot of Penrice Castle and the naturalist L. W. Dillwyn, who brought their finds to the notice of the geologist Rev. William Buckland. The following year Rev. W. Buckland undertook a major excavation at the site finding a single stone implement and a partial human skeleton covered in red ochre and a shell necklace nearby. Buckland wrongly assumed the skeleton to be that of a woman and soon became known as the "Red Lady of Paviland". Buckland a creationist assumed the skeleton to be Roman, grossly underestimating the age and importance of the site. The skeleton was in fact that of a young man in his early twenties, but the name "Red Lady" still is closely associated with the site. The skeleton and artefacts are now housed at the Natural History Museum at Oxford University where Buckland was the first Professor of Geology. Further excavations took place in 1909 and 1911, but it was a significant and systematic excavation and survey undertaken in 1912 by Prof. W. J. Sollas that revealed the full extent of the occupation and use of the site. Sollas identified over 3600 worked stone fragments of which 700 were tools, most discarded in the spoil of earlier excavations. Advances in radio-carbon dating have cast further light on the age of the skeleton, with the most recent re-calibrated dating from 2009, placing it over 34,000 years old, a significant increase on earlier dates. 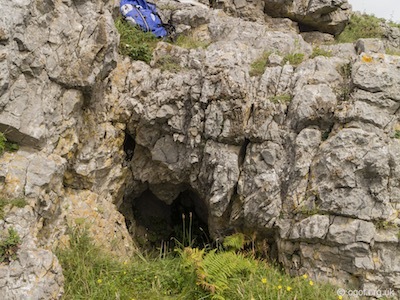 The highest accessible cave in the Paviland cliff, it is situated in the same fault as Hound's Hole, and may be reached by a rope-assisted climb from below on a route generally following the fault plane. 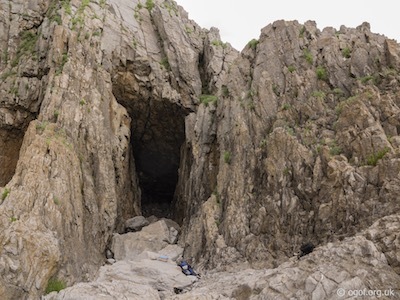 The entrance was found is about 2 metres high and 1 metre wide, and the first passage penetrates for 3 metres with standing height to a narrowing and a blockage consisting of hard, brown cave earth. 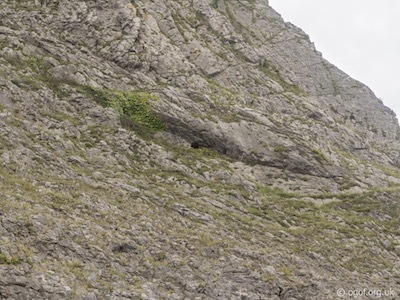 On the right is a steeply ascending side passage, of crawl height, which opens on to the cliff face in a solution hollow easily visible from below. A remnant of stalagmite survives in this entrance. The cave earth contained bird and fish remains and a trench over 1 metre long excavated in November 1990 revealed many limpet shells and some cockle shells. Charcoal was absent and it was also absent from the interior of the limpets - usually a sign of human activity. A sterile stony clay was reached at a depth of 30 cm so it is concluded that the cave is not archaeological. The cave is sometimes used as a resting ledge by climbers whose tapes and other aids adorn the cliff face above. 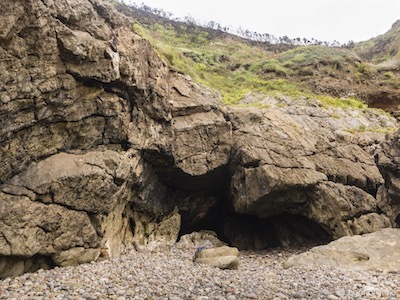 The cave is approached from the coastal footpath via Foxhole Slade where it is approached at low tide where for a very short window of time you can head down the east side of Foxhole Slade to drop down onto a narrow section of beach. The sea cave is on the beach level immediately east and almost below Paviland Cave. A boulder strewn chasm leads up to the entrance which is about 5 metres high and 4 metres wide. The cave is about 16 metres long and has a freshwater resurgence at the rear of the cave. A large quantity of flints were reported to have been found in this cave after a storm in 1910. It is probable that they were washed in from - Paviland Cave after being discarded from earlier excavations. Foxhole Slade can be reached from the coastal footpath or via a public footpath from the hamlet of Pilton Green. The cave is located near the head of Foxhole Slade on the west side of the slade almost opposite a prominent pillar of rock. The entrance large and triangular about 5 metres wide at the base and about 3 metres tall. The entrance portal is about 3 metres deep with a tight passage leading off at the back of the shelter which is about 7 metres long. 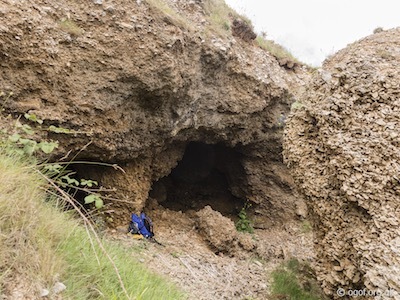 The cave has been investigated and excavated on several occasions from 1997 to 2012, during which time evidence of three human burials with bones dated from 4625 to 6785 BP were found. During the excavations Mesolithic stone tools and animal bones were also uncovered. This cave is located on the east side of Foxhole Slade, facing westerley and directly opposite to Foxhole. It is about 20 metres above the floor of the slade and the entrance is only 1 metre wide by 30 cm high. The passage goes in about 2 metres, it is not known to be archaeological but there is brown cave earth on the floor. A smaller entrance, which is not connected, lies at the same altitude but 8 metres nearer the sea. 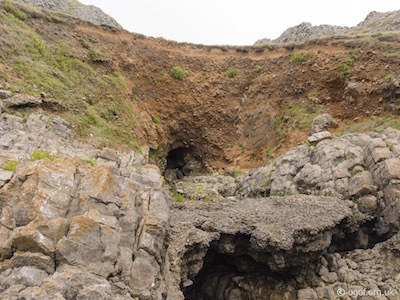 The cave is situated on the east side of a gully that runs down to the sea east of and parallel to Foxhole Slade. The entrance is located near the top of the rock promontory on the east side of this gully and faces south over the sea. You can climb up the east of the hole and traverse around to the entrance. The entrance has some very thick blackthorn and hawthorn bushes in the entrance that make entry tricky. The entrance is about 2 metres high and a metre wide, closing down after about three metres. The site has been excavated and revealed the following species: Dog, Fox, Pig, Cow, Deer, Sheep / Goat, Bird, Fish along with worked flints. The site is located at sea level in Blackhole Gut, a very steep gully with near vertical sides. Descent is quite difficult and should only be attempted on very low tides. There are a number of circular pools in the inter-tidal zone beneath the crag at Blackhole Gut. A short length of sump explored by Nelson Goodwin in October 1983 was thought to be a resurgence. In 1997 Martyn Farr took advantage of an exceptionally low spring tide to check out all the possibilities. There are several circular pools which were all found to be blind at under 2 metres depth. An elongated pool on the highest bench (below high tide mark) revealed two discreet but separate entrances less than 4 metres apart. 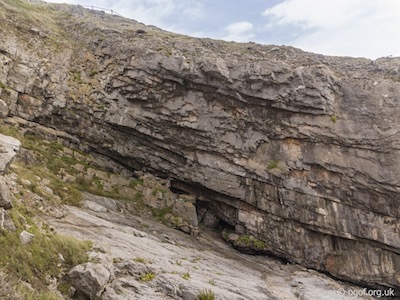 The two caves ran parallel to one another directly back into the cliff, but both terminated less than 10 metres from the surface at about 3 metres depth. It is extremely unlikely that any freshwater resurges in this vicinity. The site is located on the upper slopes of Blackhole Gut and was identified by Mel Davies in 1983 when investigating Bat hibernation sites. The cave is about 1.5 m wide and about 50 cm high. The cave was originally filled with rubble and in clearing some of this to enter the cave Mel discovered some bones. Some of these were identified as being human and so he returned to excavate an area of a metre square to a depth of 20 cm. During the excavation bones of small animals including Fox, Pig and Badger were found. The cave entrance was blocked up with rocks and timber to prevent access by sheep and preserve the site. 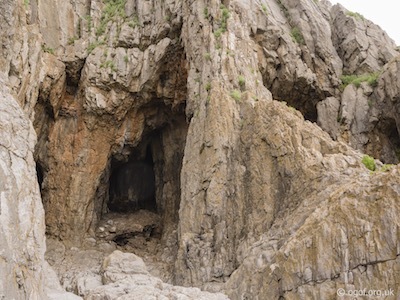 The cave was identified by Mel Davies on his assesment of cave locations on the south Gower coast that had potential to contain archaeological remains. The site is located at the head of a 4 metre climb up an exposed rock face, the entrance being obscurred by brambles and ivy. 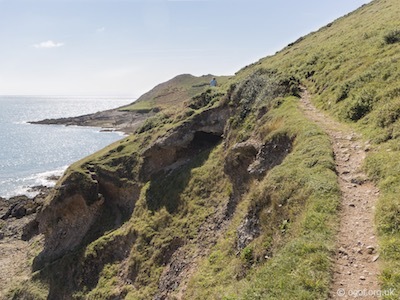 The entrance faces south and is reached from a steep wide grassy slope that leads from a collapsed wall beside the lower cliff footpath up to a rocky promontory. 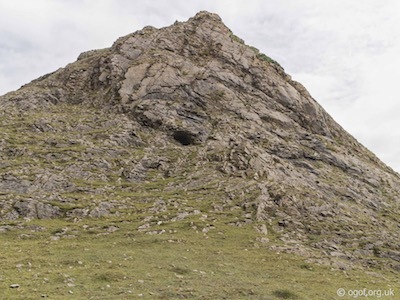 At the top of the slope a climb of 4 metres reaches the entrance which is about a metre wide, less than a metre high and leads through to a small chamber only 1.5 metres wide. The entrance is recorded as being a nesting site for ravens. The cave is located above Boundary Gut slightly west of the lower cliff footpath and in an exposed rock face. The entrance faces the sea and is about 60 cm wide and 40 cm high and closes down quite quickly. There are other solutional features seen in the rock close to this site and at a similar level. The cave is located in the sea cliff just below where the boundary wall comes down to the coast from the upper cliff. The cave is approached from the lower cliff footpath. This is an important raised beach site. It is a small gut immediately west of the low rocky promontory known as the Knave Bank, below the Common Cliff west of Overton. It bears some resemblance to the Common Cliff West Cave which is about 80 metres to the east. A rock platform is covered with a massive deposit of cemented raised beach material of pebbles and sand. 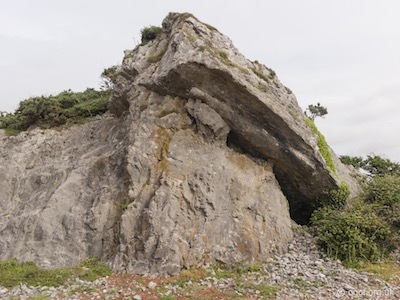 This over 2 metres thick and is overlaid by a cemented mass of limestone breccia 2 metres thick extending to the foot of a low cliff of red cemented breccia over 10 metres high. During the winter of 1982-83 high seas carved a great cavity into this low cliff, bringing down many tons of cemented breccia. This cave measures 8 metres in width, 9 metres in height and 7 metres in depth. The cave is located in the sea cliffs about 100 metres to the west of where the boundary wall comes down to the coast from the upper cliff. The cave is approached from the lower cliff footpath. The cave has a breccia roof over 15 metres thick. The cave entrance is over 3 metres wide x over 4 metres high and can be entered for about 14 metres. The final four metres of cave is narrow and low, ending in a final section almost 3 metres high. The cave has a well preserved mass of 'raised beach' shingle in front of it. The cave is located in Common Cliff in a gully between two rock faces about 250 metres west of Longhole. The site was discovered by Mel Davies in 1983 and identified as a potential archaeological site. The area outside the cave had possibly been excavated by Dr. J.B. Campbell in 1969, but has not been confirmed. The site has a scalloped wall above an infilled rock arch over 2 metres wide. The cave development can be seen in the roof continuing downwards particularly on the east side. Mel Davies excavated just the top layer of deposits under the rock arch and discovered a number of bones including two parts of a human mandible. The animal remains came from the following species: Fox, Badger, Pig, Ox, Sheep/Goat, Hare, Mole, Bird, Fish and shells. The entrance arch was blocked to prevent sheep disturbing the remaining archaeology. Cavers unknown have dug here in the following years, but the site has been infilled to preserve the archaeology. The cave is located in the sea cliffs about 100 metres west of the boundary wall that separates Longhole cliffs and the Common cliffs. The cave is approached from the lower cliff footpath. An 8 metre thick breccia roof is formed in a gully at the head of the cave. The cave entrance is about 3 metres square and the cave can be entered for about 15 metres. The cave has a well preserved mass of 'raised beach' shingle in front of it. The entrance is 1.3 metre high and 1 metre wide, opening off a grassy, dip slope which is about 3 metres wide. Other solution holes which are smaller run off the same ledge for 10 metres eastwards. It is a badger sett with bundles of dry hay and fresh latrine pits just inside the entrance. The passage becomes constricted but a flat, clay floor is visible about 6 metres inside after the initial slope of cave-earth on rock dipping at 30 degrees. A nearly circular rock tube obscured by vegetation and facing exactly south 1.6 metres high and 2 metres wide with a rock floor running down dip. Within 4 metres the floor levels off to give a horizontal, earth floor. The passage appears to go for 9 metres in total but the far end is only of crawling height. 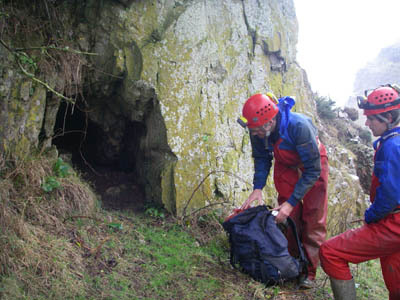 The cave is located at the base of a low rock bluff to the east of Stonecrop Holes. The entrance is about 60cm wide and 20cm high with a floor of small stones and clay. The passage has a curved water worn roof that dips gradually, the passage maintaining the same height for approximately 4 metres. At the end of the apssage it appears that there may be a cross passage. 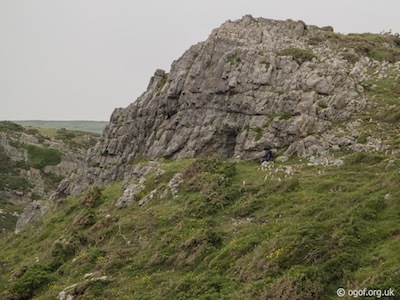 Longhole is located in the upper cliffs about a mile west of Port Eynon and best approached from the upper coastal footpath. Following the boundary wall from the hamlet of Overton, the footpath should be followed until just west of the cave. The area around the cave is covered in particularly thick gorse but just to the west footpaths lead down towards the cave. 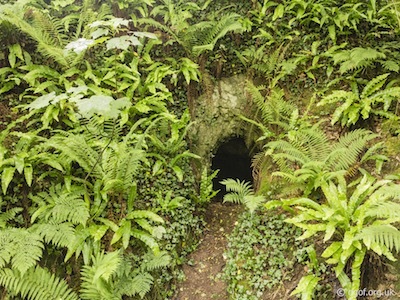 The cave is located in a gully in the west end of a section of the upper cliff and in summer the entrance area is is covered with dense nettles. The sheltered cave entrance leads into a passage about 15 metres long, which near the mouth is 4 metres wide and just over 2 metres high. The cave gradually reduces in size to end as a small crevice. The cave was originally excavated by Col. Wood in 1861 who found an extensive array of fauna from the following species: Cave Bear, Badger, Polecat, Marten, Otter, Fox, Wolf, Hyaena, Wild Cat, Lion, Irish Deer, Reindeer, Red Deer, Bison, Pig, Horse, Soft Nosed Rhinoceros, Woolly Rhinoceros, Straight Tusked Elephant, Mammoth, Mountain Hare, Rabbit and Water Vole. A number of flint tools were found in the cave suggesting human occupation occurred at this site, and it has been suggested that this site was occupied in the Palaeolithic period at the same time as Paviland Cave. In 1969 Dr J.B. Campbell excavated the area around the entrance to discover four distinct layers with separate faunal assemblages. This cave is found in the cliffs below and to the east of Longhole Cave. This area is covered in particularly thick gorse and this cave can best be approached from the lower cliff footpath. The cave is a rectangular opening following the dip of the bedrock in and exposed section of rock. The 1 metre wide x 1 metre high entrance faces the sea and leads to a short section of passage along the bed of the rock. 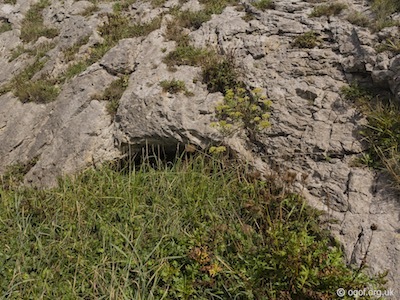 This is an area of rifts and solutional features in the fissures of the limestone that lies in the rocky outcrop just above the following entry and is located south of Longhole Cave. The main rift is aver 2 metres high, 60 cm wide and penetrates for over a metre. There are other fissures and soultional cavities beside and above this main feature. 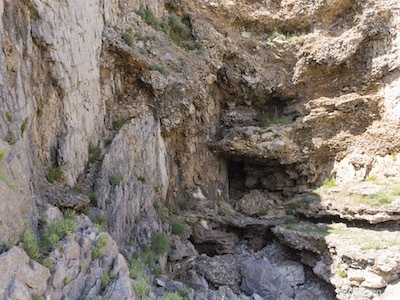 This cave is found in the cliffs south of Longhole Cave. 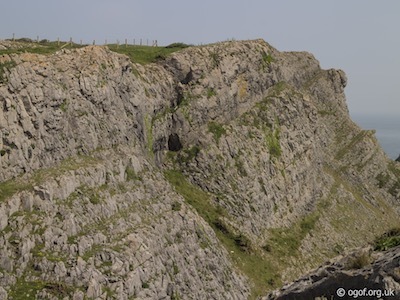 Located a short distance above the lower cliff footpath the cave faces almost due south. The passage has a smooth arched roof which is about a metre wide and 80cm tall. The floor is of brown earth and stones and gradually meets the roof after about 2 metres. The passage dips gently with the beds of the local rock. The cave was briefly excavated in 1984 and found to contain no archaeological remains. This cave is found in the cliffs below and to the east of Longhole Cave. This area is covered in particularly thick gorse and this cave can best be approached from the lower cliff footpath. The cave is an arched opening on the east side of an area of exposed rock. The one metre wide x one metre high entrance leads to two metres of passage. 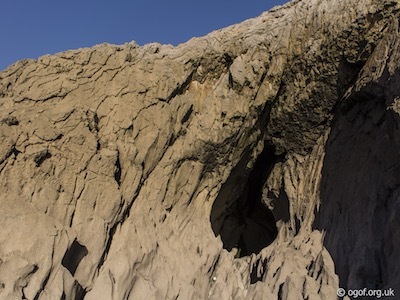 This cave is located in the sea cliffs at the eastern end of the Longhole Reserve. The 'cave' is formed under a cover of a cemented raised beach platform for the first 20 metres where a opening provides a daylight entrance and the cave proper begins as the sea cliff 'head' deposits are reached. A scramble over sea washed boulders leads into the cave passage where it ascends through gaps to s a small clay floored passage, which has been assesed to contain little archaeological material. The passage ends after 50 metres. On the west side a passage rises steeply and contains freshly growing stalagmite curtains, but closes immediately. 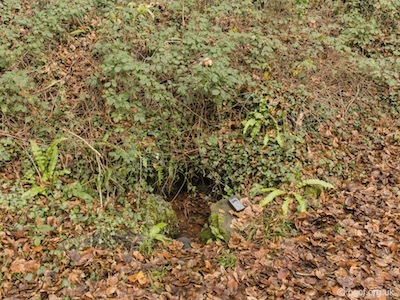 Located below the eastern end of the Longhole reserve, immediately west of Home Cave is a spring in a deep gulley that issues water. The spring was issuing about 40 litres of fresh water a minute when observed. 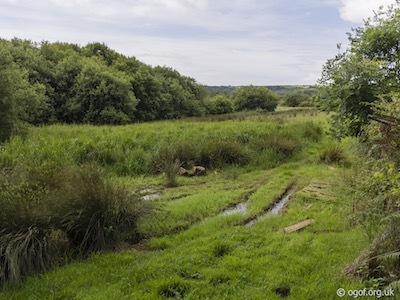 The water emerges from an area of storm washed cobbles at the head of the gulley and the source is presumed to be draining from the dry valley near the eastern end of the Longhole Reserve. 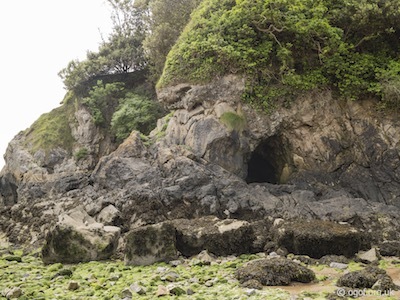 Located below the eastern end of the Longhole reserve, this is a striking sea cave with a tear-drop shaped entrance. The cave can be followed for 20 metres to end in a fine alcove with some possible development in the roof. Some interesting solution markings are noted on the walls of the rear section of this cave. 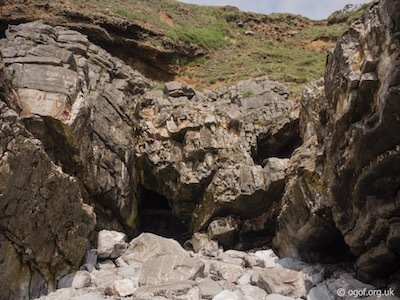 This cave approached heading west along the coastal footpath from Port Eynon. As the footpath enters the Longhole reserve a ruined limekiln is seen beside the path. Behind this is a rock buttress which contains two caves. This cave is located on a grassy bank that runs up to the towering rock face above. This is one of several solutional holes that may be connected, this one being the only one large enough to enter. This cave is a body sized tube with a flat earth floor that can be seen to extend for at least 3 metres. 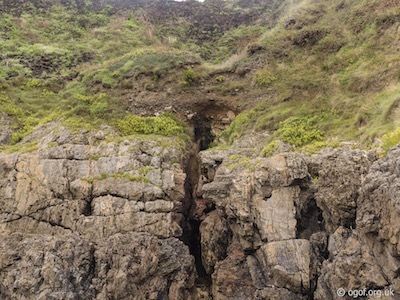 This cave approached heading west along the coastal footpath from Port Eynon. As the footpath enters the Longhole reserve a ruined limekiln is seen beside the path. Behind this is a rock buttress which contains two caves. 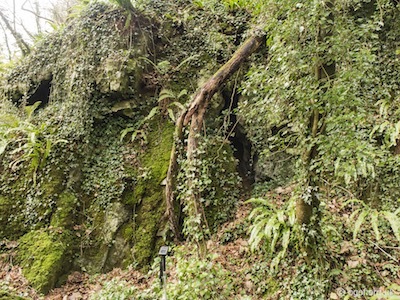 This cave is located near the top and the entrance is obscured with ivy and undergrowth. The cave can be accessed either from the top via a rope or by traversing up from the east along a ledge and then making a short climb down to the entrance. The cave entrance is about 2 metres x 2 metres and faces the sea. The floor of the cave is covered with rocky deposits containing dog tooth calcite crystals. 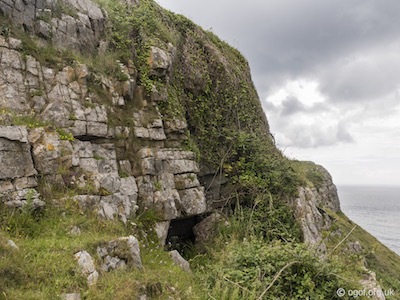 This cave approached heading west along the lower coastal footpath from Port Eynon. Just before the footpath reaches the Longhole reserve a massive cliff on the right - Overton Cliff is seen. The cave is seen clearly in the southern rock face. An easy climb up from the east leads to the entrance which is 2 metres wide and about 3 metres tall. The entrance has a commanding view out to sea and the passage can be followed for about 5 metres reducing in height slightly until it ends abruptly. The floor is very flat bare rock and at the back of the cave on the left is a small section of calcited rift. 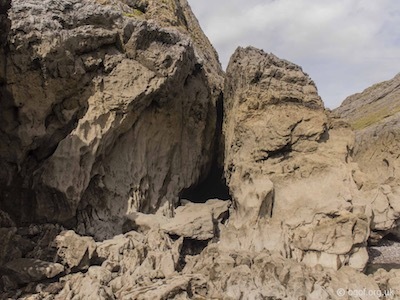 This cave approached heading west along the lower coastal footpath from Port Eynon. 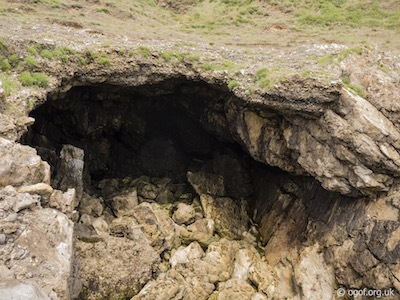 This small sea cave is found on the west side of the headland to the west of Overton Mere. It is situated at the head of a wide gully extending into the lower cliff. The mouth is over 2 metres wide and about 3 metres high. The main cave is only 3 metres long apart from a narrow passage found at the rear of the cave which requires a climb up of over 2 metres to reach it. 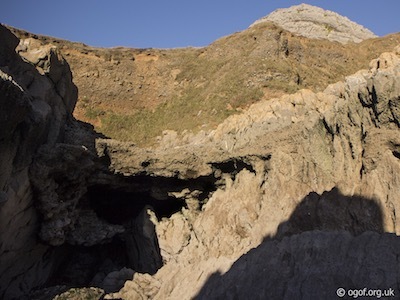 This cave approached heading west along the lower coastal footpath from Port Eynon. 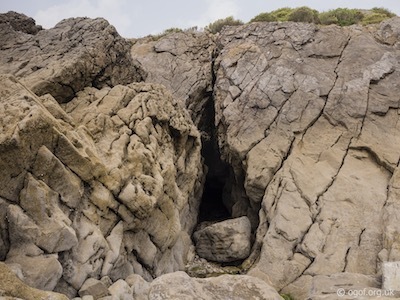 The cave is located in the eastern section of Port Eynon Point and can either be approached from the west on the rock beach at low tide or via the coastal footpath from Overton Mere in the east at other times. The cave can be accessed up to half tide, beyond which time the gully up to the entrance to the cave is inundated with water. This is the most iconic of all the Gower coastal caves with a 20 metre tall masonry wall enclosing the entrance to this cave. The wall is set about 6 metres in front of the back wall of the cave. A doorway is located above the high tide mark and above it are a set of window openings. From the gully there is a very slippy climb up of over 6 metres to reach the doorway, and often some tatty rope hangs down to assist the climb. The internal wall face is honeycombed with around thirty tiers of L-shaped nesting boxes which is still home to hundreds of pigeons. These birds were once an important source of food providing meat and fresh eggs during hard times and pigeon houses can still be seen at the castles at Oxwich and Penrice. It is interesting to note that 'Culfre' in Old English is equivalent to 'pigeon' and that the dialectal 'culver' for 'wood pigeon' is still used in some parts of England. At times a lower entrance has been open to give easy access to the bottom of the sea cave, but this is now buried under cobbles and rocks driven up the gully by storms. The rope for the entrance climb can be used to assist the climb down once inside. From the doorway a flight of crumbling stone steps leads up to the higher levels. From the third window an exposed traverse is possible to to a roof passage which continues, over a dangerous deep hole, to a clay floored passage. This ends immediately in a high chamber some 20 metres in from the stone-built-wall, the holes in which conveniently admit light to illuminate the further reaches of the cave. 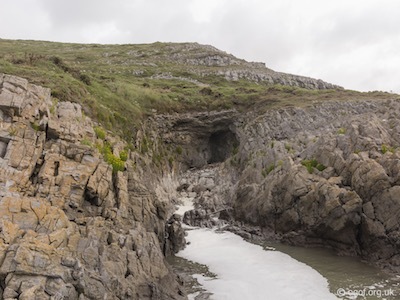 The cave is situated at the southern tip of Port Eynon Point and it is best approached by following the shore from the village. The cave can only be accessed at beyond half tide. The cave has been excavated and the remains of Lion, Bear, Woolly Rhinoceros, Mammoth and Red Deer have been found. The large entrance some 7 metres wide and 10 metres tall has a flat roof formed by a major bedding plane in the rock above. The cave consists of a large sea cave chamber and at the end there is a climb up and beyond is a small tunnel leading to an inner chamber. There is another smaller sea cave a little to the west of this cave. 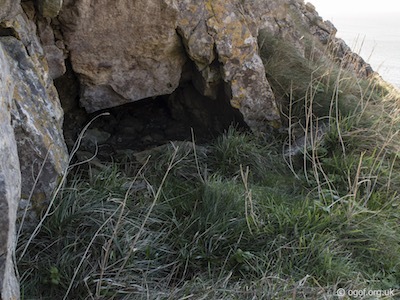 Located in the lower section of the old quarries at Port Eynon point is a rock shelter with some evidence of solution in the roof bedding. The cave is less than 3 meters in length and likely to have no speleological or archaeological merit. At this site are two small resurgences located below the Nicholaston Woods in a field about 300 metres east of the house named "Underhill". They are the resurgences of the Perriswood Farm Swallet, the western being the most significant rising. This rising is located beside the lower track that runs through the Nicholaston Woods. The rising is located on the north side of the track as it begins to gain height after passing the Nicholaston Pill West rising and before the area of the Underhill Wells risings are reached. The water rises at the base of the wooded hillside beside the track and is diverted underneath it via a pipe. This cave is located beside the upper track that runs through the Nicholaston Woods. At a point where the track passes in front of a rock buttress ( Pill Tor ) the road intersects the cave which was likley uncovered when the track was constructed around 1790. 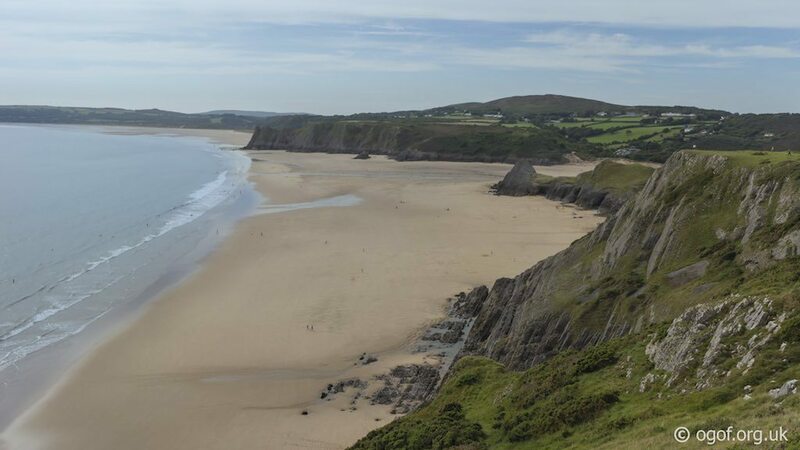 The site is directly above where Nicholaston Pill flows out over Oxwich Sands on its route to the sea and gives a magnificent view of the bay. The cave entrance is about 50 centimetres high and about 45 centimetres wide. The low stone floored passage can be seen to head into the hillside for a little over 2 metres decreasing in size. There is a small passage leading off to the right from near the cave entrance, which must end very close to the surface. There is no record of any archaeological investigations at this site. 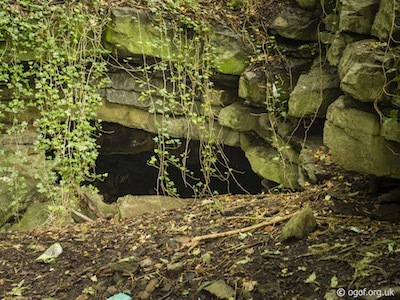 This cave is located beside the lower track that passes through Nicholaston Woods. 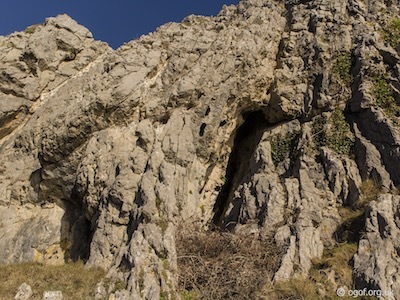 The cave is located in a 5 metre high rock face in an area of very old quarries. The entrance is a 2 metre high rift, about 50 centimetres wide. The passage is blocked with red sand and stone fill after only one metre. This rising is located in the woods just above the footpath that follows the lower route through the Nicholaston Woods. The stream is encountered as it passes under the footpath and can be followed north into the woods where it splits to reach its two sources. The most defined source is a discrete rising directly north of the footpath and is shown in the photo with this entry. Before this rising is reached a second source flows out of a large boggy area to the east of the stream. The west rising is the larger of two Nicholaston Woods risings which were researched by W.J. Chambers in 1971-2, where water sinking in the swallets above in Nicholaston was traced through to these risings. The west rising was shown to be fed from water sinking at the Oakdale and Penmaen Church Swallets with flow through times of about 20 hours. This rising is located in the woods just abve the footpath that follows the lower route through the Nicholaston Woods. The stream is encountered as it passes under the footpath and can be followed north a very short distance before it rises from a poorly defined area. The flow of water is much less that that encountered at the west rising. The east rising is the smaller of two Nicholaston Woods risings which were researched by W.J. Chambers in 1971-2, where water sinking in the swallets above in Nicholaston was traced through to these risings. The east rising was shown to be fed from water sinking at the Blind Pot Swallet with flow through times of about 20 hours. The cave has two entrances situated near the top of the Great Tor which is located on the eastern side of Threecliffs Bay. The cave is difficult to reach and needs to be approached from the top of the Tor. 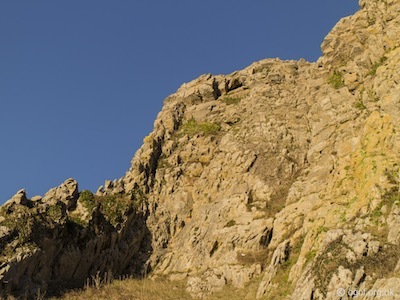 The Great Tor can be approached from Threecliffs Bay by heading over Penmaen Burrows and following the coastal footpath to this massive promontory. A narrow exposed footpath takes you over the top ridge of the Great Tor to the large 'hump' near the end where the cave entrances are located. The entrances are on the eastern side and you need to climb down about 10 metres to reach the main entrance that has a small grass covered platform outside. The triangular shaped entrance is 3 metres high and 2.3 metres wide, with a flat floor. The passage leads to a main chamber that is up to 4 metres tall and 2.4 metres wide. At the end of the chamber a low crawl leads to a small terminal chamber. From the end of the main chamber a passage on the right leads to another, higher entrance, this 10 metre long passage is a round, clean washed tube ascending steeply. This leads to the second and less accessible entrance located about 5 metres away and a little higher than the main entrance. 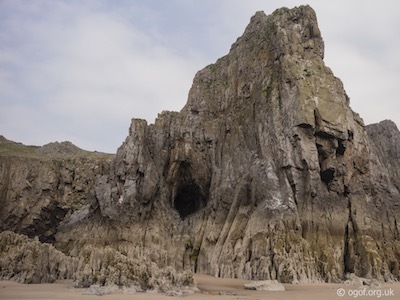 This impressive sea cave traverses the Three Cliffs rock promontory at Threecliff Bay. The cave is revealed at low tide and visited by thousands of holiday makers. 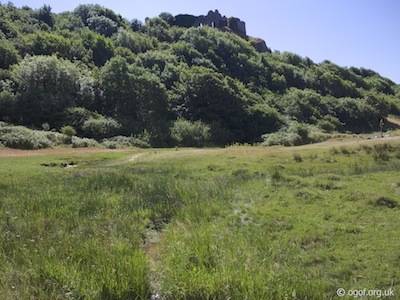 When following the typical route to Threecliff Bay by walking beside the stream from Parkmill down to the sea, you pass below the ruins of Pennard Castle high on the dunes of the east side of the bay. It is from the wooded hillside below the ruins that a small stream can be seen to emerge. This is the first and largest of a series of small resurgences that join the flow of the stream as it makes its final journey to the sea. This particular resurgence can be followed back into the undergrowth for a few metres until it is seen to emerge from a mass of scree, not being penetrable for any distance. 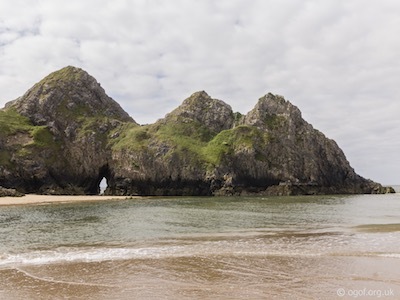 The cave is located in the last gully before Shire Combe Head on the eastern extremity of Threecliffs Bay and can only be visited at low tide. The cave is over 20 metres long with an entrance 2 metres high and over 3 metres wide. 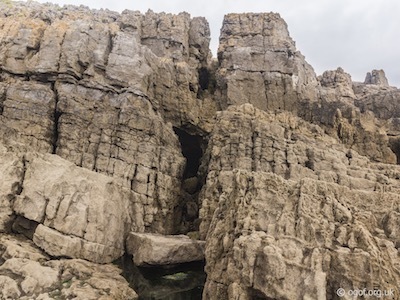 The interior is a pebble-strewn crevice with openings in the roof to the raised beach platform on the cliff above. 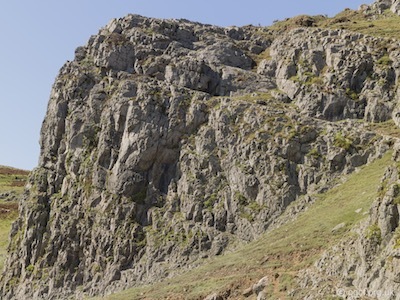 Shire Combe Head is easily identified by the striking rock pillar projecting seaward from the main cliff face. The pillar is cut behind at the base by a tall narrow slot-like natural arch formed along high-angled bedding planes. 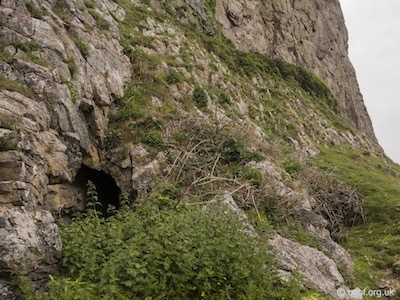 The cave is located in the cliffs overlooking Shire Combe Sea Cave. Above the sea cave is a rocky platform about 10 metres above sea level with several holes that lead down to the sea cave below. On the sloping cliffs above this platform facing west is a triangular entrance about 80 cm tall and about 1 metre wide at the base. The cave has a compacted mud floor with rock fragments present and decreases in size until it ends 2 metres in from the entrance. The cave is located in the steep cliffs to the west of Double Arch Cave and can be approached from the prominent rock platform that is found at about 10 metres above the sea. Just before a section of raised beach is found attached to the cliff, the cave can be seen in the cliff about 5 metres above the rock platform. The cave has not been entered by the author. This sandy, double-arched cave faces east and is located about 100 metres west of the famous Ravenscliff Cave. The left or south arch has a maximum height of 1.2 metres and the right or north arch 0.8 metres. The total width of the caves is 5 metres and they are believed by J G Rutter to be archaeological, but there is no record of any excavation. The cave floor is in places 0.4 metres below the level of the grassy slope outside. There are solution cavities a metre high in the ceiling proving that this is a cave not just an overhang, and the slabs protruding through the sandy floor at the back appear to be naturally fallen and undisturbed. The cave is of little interest to potholers but has very high archaeological potential. The site was excavated and recorded by J.G. Rutter and is described by Oldham as being located 135 metres west of Ravenscliff Cave in an area of stratified sand. The excavation should be about 8 metres above the prominent raised beech ledge that can be followed west from Ravenscliff Cave. The present cavity is the result of a small scale excavation by J. G. Rutter in 1949 and extended into the sand under the cliff overhang for 3 metres. The author could not positvely identify the site, and the photo included is of the only area of sand deposits found to the west of Ravenscliff Cave, in which the site must have been located. When first examined by Falconer and Colonel Wood, there was no indication of an opening in the cliff face, for the mouth of the cave was completely closed with sand. The original excavations by Colonel Wood appear to have been quite extensive and revealed extensive evidence of warm climate Pleistocene remains. No evidence of human occupation were found but evidence of a southern form of Hippopotomus was recovered. In 1976 Dr. A. J. Sutcliffe and A. P. Currant of the Natural History Museum began the re-excavation of this cave. Further Pleistocene animal remains have been found including the Narrow-nosed Rhinoceros and Hyaena. The easiest way to reach the cave is to approach it from the foreshore at low tide heading east from Foxhole Bay. The cave is located on a prominent platform some 10 metres above the high water mark and can be reached by an easy scramble upwards. Following excavations the cave now has an entrance 10 metres wide and 7 metres high, leading to 15 metres of rapidly diminishing passage. A short but difficult climb in the roof leads to a short passage over a false stalagmite floor. The small formations in this cave are all damaged or completely destroyed and the walls have been vandalised by a fresco of psychedelic artwork of the 1970s. The cave is located about 100 metres west of Fern Cave and directly above Ravenscliff Cave and was first recorded by Cwmbran Caving Club. The tight entrance squeeze leads into a chamber, 2 metres high with a small impossible hole near floor level leading back to the surface. Bones of rabbit and fox were noted. The cave has not been entered by the author. The cave is located between the Devil’s Kitchen and Ravenscliff Cave, and is about 25 metres above sea level facing approximately south west. The 1 metre high by almost 2 metres wide entrance niche leads to a tight phreatic squeeze after 1.3 metres. This fine solution tube has a stand-up aven but both ways on are too small. About 100 metres west of the above lies another hole in the cliff, a rectangular one just big enough to enter. From the entrance it drops immediately into a chamber with standing room and a gleam of light entering from a small solution hole from the down-dip end. Bat guano was seen in one roof tube, but there was no way on. These caves have not been entered by the author. The cave is located in the cliffs below a rock promontory to the west of the Devil's Kitchen. The cave is approached by heading down the rough path to the Devil's Kitchen and then traversing westwards a short distance. The entrance is about one metre wide and 50 cm tall and is hard to spot due to vegetation growing in front of the entrance. The cave was original discovered in 1956 by Frank Miners and then dug and explored in 1957. Frank Miners communicated his discovery to 'The Taylors' as he felt the site was worthy of further exploration and excavation. Consequently 'The Taylors' referred to the cave as Frank's Hole and the site reorded in their caving journals. It was later in 1985 that it was rediscovered by Mel Davies and a small excavation undertaken the following day with the assistance of J.G. Rutter. They had no knowledge of the previous discovery nearly 30 years earlier and recorded the cave as a new find. During their exploration they discovered a single human burial in the mouth of the cave and the cave could be seen to continue as a low clay floored passage. In 1991 following some digging by cavers, a second dig was undertaken by K. Brasil and E. Walker to extend the original trench and recover the human remains left in-situ by Davies and Rutter. A row of stones across the entrance was noted and a phalange of a sheep also uncovered. Frank Miners reported a small phreatic passage at the back of the cave that appeared to be a small rising that would issue water in wet weather and a channel in the floor of the rear section of cave through which the water flowed before sinking in an area of loose rock about midway through the cave. This site is located in the sea cliffs below Southgate. Between the high and low water marks on the shore there is an archway accessible at low tides with fresh water pouring out. This is known to some as the Westcliff spring and it is reputed to be polluted. 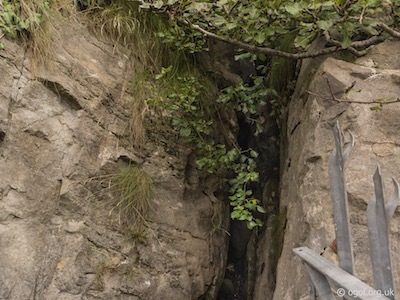 The entrance is about 3 metres high and over 2 metres wide and can be followed, walking height, for some 10 metres to where the water is seen to well upwards from a fissure too narrow for cave divers. 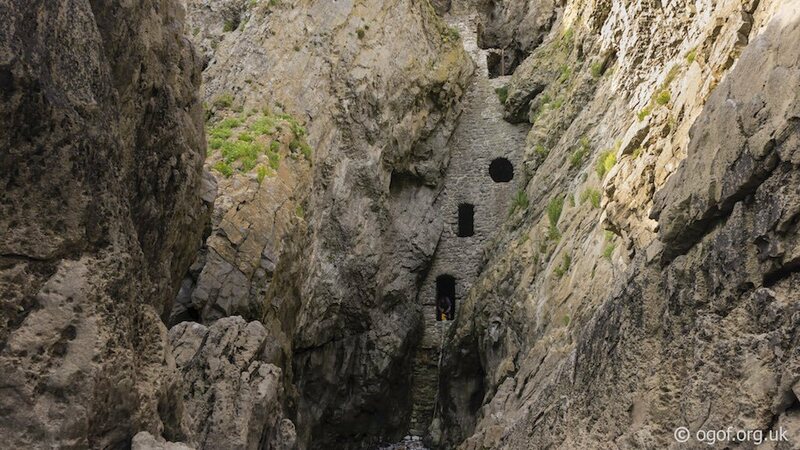 The passage then continues for a short distance to the foot of a narrow shaft which opens higher on the cliff face. 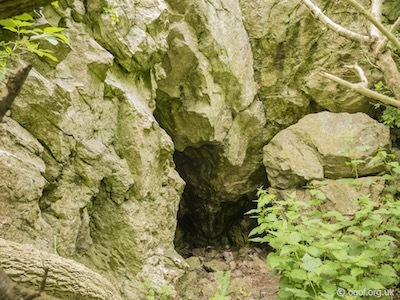 This cave is located near Southgate about 600 metres west of Foxhole Bay. The site comprises of a sea cave which is linked to a rocky cove above by two blowholes. In the area around the top of the caves are large deposits of cemented blown sand up to 10 metres thick. The largest blowhole is 3 metres in diameter and about 10 metres deep. 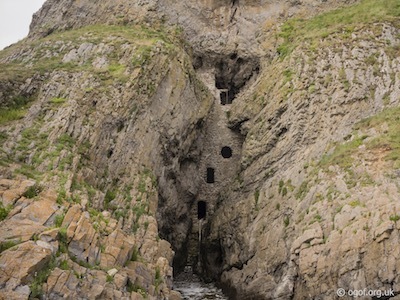 The sea cave can be accessed from the rocky beach on low tides and on the left side of the main chamber is a small chimney containing some small formations. At the top of the site there is a small rock shelter to the east of the blowholes, but at both sites no significant archaeology has been found. 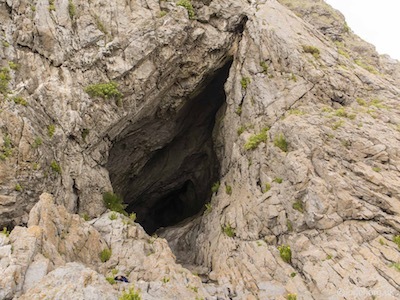 This cave is located in the cove that contains the upper entrance to Devil's Kitchen. The cave is located on the east wall of the cove, the entrance facing west. The cave has a triangular entrance about 2 metres high and closes down after a little over 2 metres. 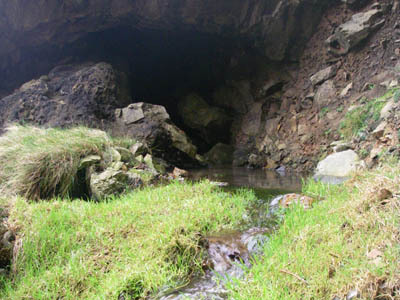 This cave is located near Southgate on the west side of Heatherslade Bay. 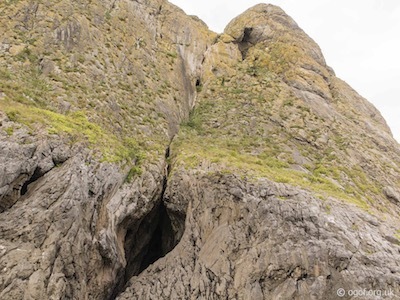 The cave is narrow and located in a small gully to the west of a large rock promontory in Heatherslade Bay. The cave is about 6 metres tall and just under 2 metres wide and consists of a narrow passage roofed with boulders that ends in boulder fill after about 8 metres. The cave is best reached by approaching from Southgate, down the slade to Foxhole Bay and then taking the path along the lower cliff round the headland to the west. 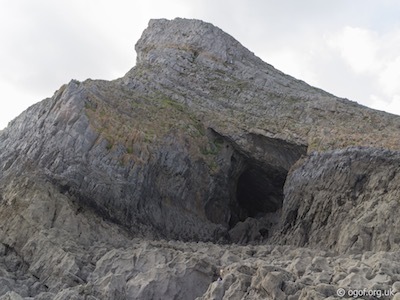 The cave was discovered in 1919 by Mr. Egerton Forester who uncovered a large Woolly Rhinoceros bone, and the cave later named after him by Allen and Rutter during their survey of the Gower Bone Caves. The cave is outwardly an impressive Gothic arch some 12 metres high and 10 metres wide. At the back of the arch is the small triangular entrance to the cave about a metre high and just under two metres wide, inside the height increases to nearly two metres and the passage continues for about 8 metres. Most deposits have been washed out by the sea due to the presence of a wide gully in front of the cave with a rocky slope to sea level over which storm waves can ride fairly easily. Prior to excavation by a Colonel Forester there was no cave present. 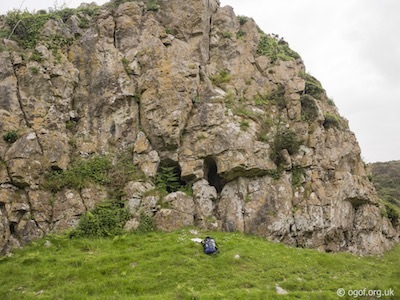 The cave is best reached by approaching from Southgate, this is an obvious cave with two entrances located in a rock outcrop on the west side near the top of Heatherslade. The main entrance faces the footpath down to Foxhole Bay and is 2.3 metres high, 1.6 metres wide and is 5 metres long, the maximum height inside being 3 metres. There is a low passage at the back which may continue. The north entrance is 1 metre high but only 80 cm wide and leads to a 5 metre long flat-out crawl. 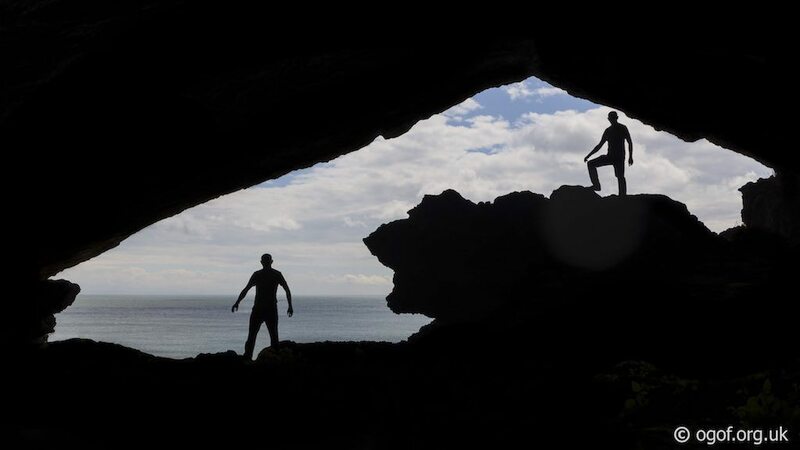 The cave is best approached from Southgate, by heading down Heatherslade to Foxhole Bay, where you can traverse eastwards around the rocky beach at low tide to reach the towering entrance to this cave. A long narrow gully leads from the sea to the entrance which then leads to a large chamber some 52 metres long and over 23 metre tall. The floor of the chamber rises very steeply, much of the void in the chamber being exposed by excavations of the deposits over the years. 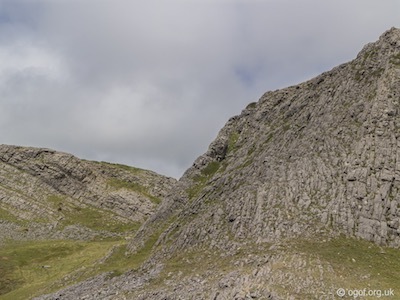 The lofty chamber has records of being climbed on two occasions, the first in the 1956 by cavers associated with Swansea University and then in 2007 my Martin and Krysia Groves who bolted up to an unentered aven, which they found to be blind. The first important excavation took place circa 1851 when Col. Wood his important finds were the bones of the narrow-nosed rhinoceros and straight-tusked elephant. In 1931 Prof. T. N. George made an excavation near the mouth of this cave. This was followed in 1946 by large scale excavations under the direction of E. J. Mason and J. G. Rutter which continued until 1959. During this period the areas of four hearths of the Romano-British period and the Dark Ages were completely excavated in the upper part of the cave. Since 1972 Dr. A. J . Sutcliffe of the BM (NH) has been making a further detailed study of the Pleistocene deposits. Finds in the cave have included the remains of Reindeer, Bear, Wolf, Hyaena, Bison, Lion, Soft-nosed Rhinoceros, and Straight Tusked Elephant. Evidence of human habitation has been made with finds including over 750 pieces of pottery, spindle whorls, combs, bone spoons, bronze brooches and roman coins. This site is best approached from Southgate by heading down Heatherslade to Foxhole Bay. 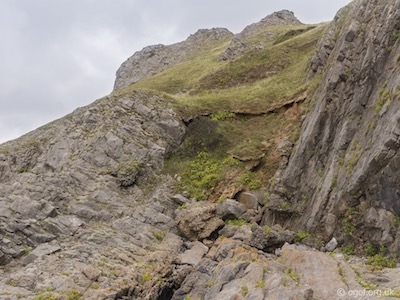 From here you can traverse eastwards around the rocky beach at low tide to pass below Minchin Hole and then further round the headland to reach a prominent gully where a flow of water can be seen emerging. Heading up the gully there are two points where a good flow of water emerges from narrow cracks in the east wall. These are reported emit silty discoloured water after heavy rain. This cave is located immediately west of the arete separating it from Bowen's Parlour. It is accessible at all states of the tide by means of a scramble from the west. The entrance is 5 metres high by 4 metres wide and is plugged by layers of cemented sandy sediments. 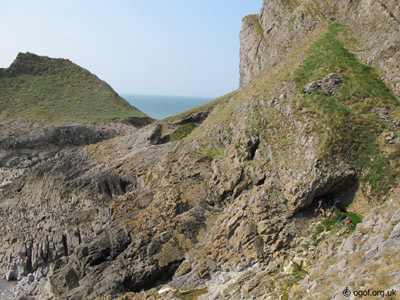 Mel Davies noted in his assessment of the site that many of the Gower bone caves were sealed in this way when first noted, it is potentially of considerable archaeological importance. 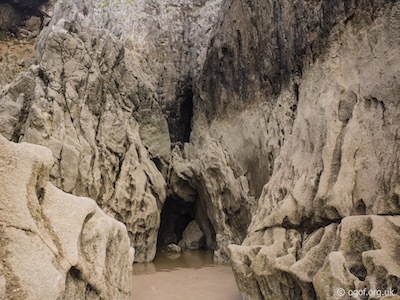 This cave is located in the sea cliffs about 150 metres to the east of Minchin Hole and is best approached from the rocky beach at low tide. The entrance is 6 metres high and is divided into two portions by a 50 cm thick shelf of cemented rock fragments. The lower section of cave is 3.5 metres high while the upper portion, which may only be reached from inside the cave, is 2 metres high. The partition reaches back into the cave for 4 metres but has then been undermined by the sea, only to start again as a shelf 2 metres from the rear wall of the cave. The entrance is only 2.5 metres wide but it becomes 4 metres wide and 6 metres high just inside, the cave penetrates a full 12 metres. Storm action has washed out any archaeology from this cave. 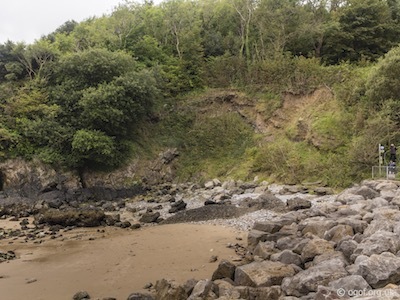 The cave is located between Bowen's Parlour and Bosco's Den and the lower section of the cave can be accessed via the shoreline at low tide. The upper part of the cave can be reached via a steep grassy slope that heads down to the cliff face from the upper coastal footpath. 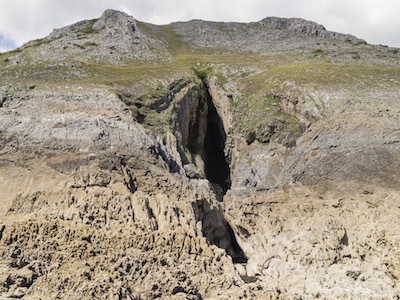 This is a peculiar cave produced by erosion of the scree infill of a rather large gully, from the shoreline you can ascend the steep gully where it rises and undercuts the cemented scree, which then roofs the gully producing the cave. The top section of the roof has a large hole in it, breaking out onto the grassy slope above the cave. The top section of the cave can only be accessed via a rope / ladder climb down the hole. The site was excavated by Col Wood in 1866 where it provided a rich selection of deposits including bones of the following species: Cave Bear, Badger, Fox, Wolf, Hyæna, Bison, Pig, Soft-nosed Rhinoceros, Straight-tusked Elephant and Water Vole. 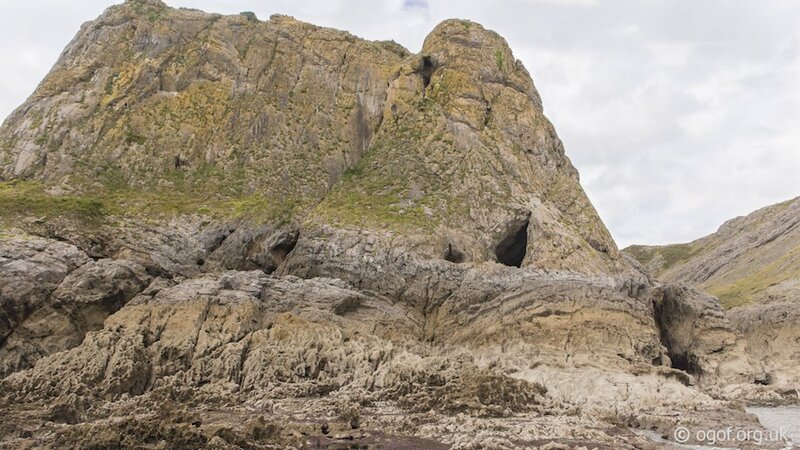 The cave is is only accessible at low tide and is best approached from the east, climbing down near Bacon Hole and heading round the rocky foreshore for around 150 metres. Bosco's Den is a tall staggered vertical feature with a lower sea cave entrance and a higher entrance up in the cliff slightly offset. The two sections of cave being separated by a floor of cemented rocks. The lower cave is washed out by storms and is about 3 metres wide and four metres tall ending after about 10 metres. 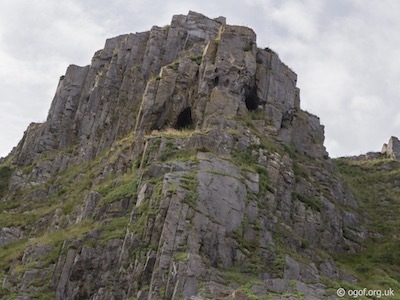 The upper entrance can be reached by climbing up on the east side and is about 3 metres wide and 5 metres tall but widens out inside to about 5 metres wide. The passage turns east after about 10 metres and ends at an upward sloping section. It was in 1858 that Colonel Wood excavated the upper storey of the cave, at this time almost filled with cemented rocks apart from a small hole which gave the cave its earlier name of Bacon's Eye. During the excavations the antlers of over 1,100 reindeer which were mainly shed from young animals were recovered. Colonel Wood also found a split pebble, now in the Royal Institution of South Wales, which is said to have been prepared for the striking of flakes. Remains were also found of the following species: Cave Bear, Fox, Wolf, Reindeer, Roe Deer, Bison, Pig and Water Vole. The cave is located to the west of the headland at the west side of Hunt's Bay. The cave is best approached from Southgate where the cliff path can be followed to a steep narrow descent that leads down to the entrance. Alternatively at low tide you can approach from Hunt's Bay, following the foreshore round the headland and then climb up to the cave. 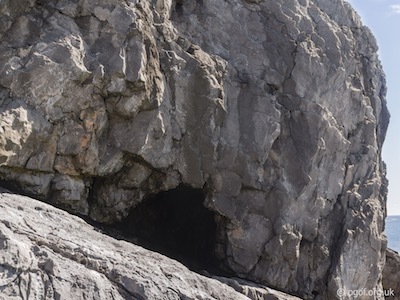 The cave has a large entrance, 20 metres wide and up to 10 metres tall with a vast overhang of rock in the cliffs above sheltering the entrance. From the inside this cave has one of the most enigmatic views outwards of any of the Gower caves. The entrance area of the cave has large deposits of breccia up to 9 metres thick. The entrance leads into a long, flat floored chamber about 45 metres long and walking height until it is blocked by stalagmite. Near the rear of this chamber is a small side chamber which once contained a set of red markings on the walls. It was inside this chamber in 1912 that Prof. Sollas and Abbe Breuil discovered ten wide red bands, almost horizontal and roughly parallel, arranged in a series about 3 ft. high and covered with a thin layer of stalagmite. Breuil suggested that the marks were the work of Palaeolithic man and the discovery created considerable controversy and was protected by an iron grille. However, observation of these streaks since 1912 has shown that significant change has taken place both in their configuration and their number. There seems no doubt that they are an entirely natural feature. Vandalism has removed virtually all trace of this feature now. In the main passage a high rift in the ceiling leads to an upper passage first reached in December 1992 by M. Winder and S. Musgrave, local National Trust staff using an extending ladder. This is likely to be the same location that was later climbed by Martin Groves in 2007. He found the aven to be 14m tall and reached a vertical body-sized tube choked with calcited boulders, This blockage is thought to lie close to the surface. The first excavations recorded in Bacon Hole were undertaken by Colonel Wood in 1850 who found remains from the following species: Brown Bear, Cave Bear, Badger, Polecat or Stoat, Fox, Wolf, Hyæna, Reindeer, Red Deer, Roe Deer, Wild Ox, Bison, Pig, Soft-nosed Rhinoceros, Straight-tusked Elephant and Water Vole. Later excavations have taken place by Prof. Sollas and Abbe Breuil in 1912 and Dr. C.B. Stringer in the years up to 1983. 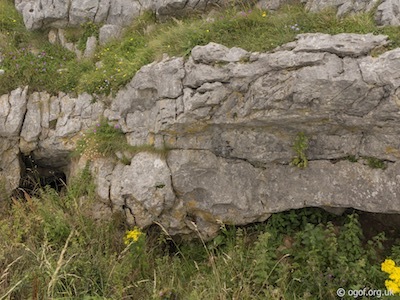 This is a site recorded by Rutter and details published in Caves of Gower by Oldham in 1982. 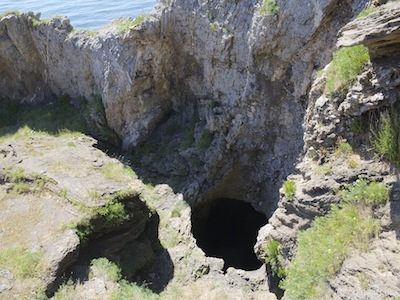 The cave was described as being located in the extreme west of Hunt's Bay, and today only one possible site can be found, although not as extensive as that described by Rutter. 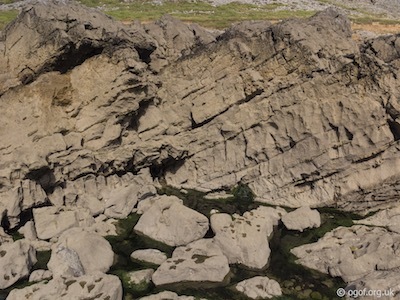 The site shown is formed in the cemented rocks of the raised beach and there is signs of extensive collapse around the entrance which would explain the mismatch from the description. The cave has a large collapse of the raised beach at the entrance and the 2 metre x 2 metre entrance leads to 10 metres of passage in the breccia. 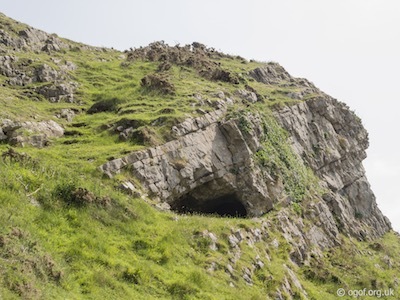 This cave is situated at the foot of a small cliff some 6 metres high just below and to the north of the promontory fort on Pwlldu Head. The cave is best approached from the lower coastal footpath where the small cliff will be visible, although in summer the entrance will be obscured with vegetation until you are very close. The cave was discovered by R Burn of Bishopston in September 1986. The cave is quite small with the entrance being 2 metres wide and about 1 metre high. The cave extends with a flat roof for about 3 metres. 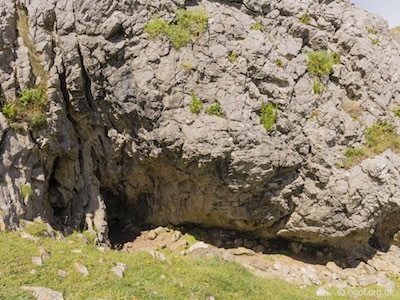 This cave is little more than a rock shelter with only a small choked crevice at the rear to offer more cave potential. The following was reported by Mel Davies to have been found in the investigation of the cave by B Burn : Animal bones consisting of the right patella of a small Bos species, possibly from what is sometimes called the "Celtic cow"; small rib fragments about sheep/goat size, and a sternum fragment from a juvenile animal. Older was a large rib with stalagmite on the proximal end, and a hacked bone fragment in the shape termed a "limpet scoop" often seen in coastal caves. There were also human remains found comprised of the following : Premolar, Left rib Metatarsus IV left and a Phalange. The site has not been formally excavated. This cave is located on the east side of the headland that separates Pwlldu Bay from Sevenslades inlet. The cave is best approached from the lower coastal footpath that runs along the lower cliff edge. The cave is located just below the footpath and can be reached outside of high tide by a short climb down onto the rocky foreshore. A gully leads to the cave mouth and a short section of sea cave. This is located on the east side of Brandy Cove at the top of the cobble storm beach. The site is best approached via the coastal footpath from Caswell Bay. This is a drainage adit driven from the All Slade Mine to drain the workings into Brandy Cove. The entrance is boarded and gated to protect it from storms and locked to avoid the general public entering this disused mine. This is located beside the junction of the footpath from Caswell Bay to Brandy Cove and that from Brandy Cove to Bishopston. It is located in a hollow and is a little more than 2 metres long and just over a metre high. This appears to be the start of a trial adit - probably associated with the nearby All Slade Mine. 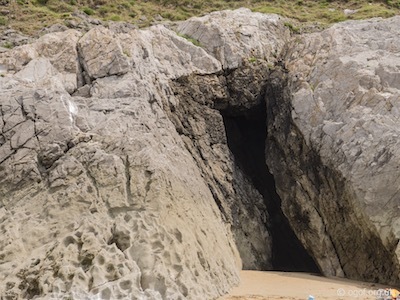 This cave is the western most sea cave in Caswell Bay and can be visited when the tide is well out. The cave is about 2 metres wide and over 3 metres tall. The cave can be followed for about 16 metres where it becomes too narrow and can be seen rising up steeply. 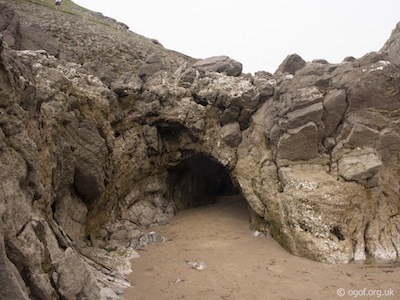 This cave is located on the west side of Caswell Bay and can be visited when the tide is well out. The cave is about 2 metres wide and over 5 metres tall. The cave can be followed for about 20 metres where it emerges at a second entrance on the other side of a rock promontory. A branch passage leads to the surface. This resurgence is located on the west side of Caswell bay near the high water mark and is enclosed in a concrete structure. Within the enclosure water emerges from fissures in the rock and then flows out under the structure over the beach to the sea. The water has been shown to originate in part from the Murton Stream Sink. This site has been dug and explored in 1991 and 2001 where the major inlet was dug and followed back through a 2 metre long restricted sump to emerge from a 15 cm diameter tube. This cave has three entrances up to 3 metres tall that meet at a central chamber with a skylight. The cave is located just north of the enclosed rising on the west side of the bay. 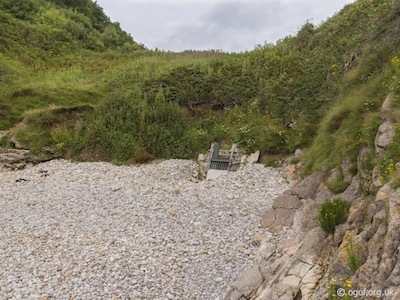 This dig is located in the cliff about 3 metres above the storm beach on the western side of Caswell Bay. The entrance is a rift passage that descends steeply and is thought to head to passage associated with the Redcliff Flood risings. Further progress would only be possible by removing soild rock to widen the rift, which is not possible being so close to nearby apartments. This is a flood rising that occurs after substantial rains and rises on the beach a short distance north of the west rising. The site was investigated by Maurice Clague Taylor in 1957 following heavy rain, where they found a route into an open but very unstable stream passage heading into the cliff. The route down to the stream soon collapsed and the dig was filled in. 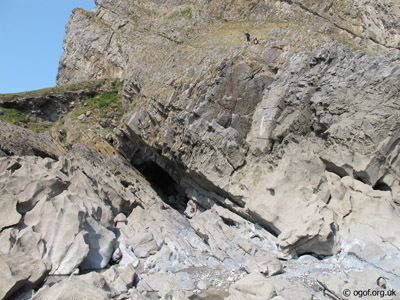 This cave is located on the short cliff that flanks the north side of Caswell Bay. A gully leads up to this very short cave, which has an arched masonry roof constructed over it. This dig is located in a fenced area behind the blockhouse that encloses the east resurgence in Caswell Bay. The entrance is located 3 metres up a short cliff-face directly below a pear tree. The site was dug for a couple of metres in the hope of intersecting cave passage related to the resurgence directly below. 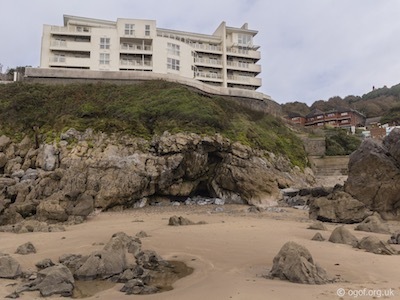 This major rising is located near the entrance to Caswell Bay and is enclosed in a building. Inside the building the water emerges from rock fissures and then the water flows out from the foundations before running over the beach down to the sea. 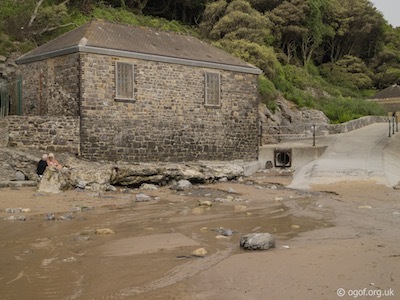 This is a flood rising that emerges from the hillside near the west side of the entrance to the Caswell Bay carpark. Richard Baynton reported in 1968 that in times of flood up to 3000 gallons of water per minute emerged from a tight hole. In drought the hole could be followed for 7 metres before becoming too tight. 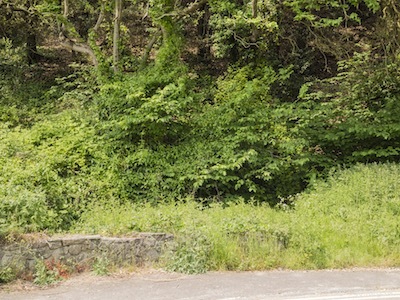 This area was landscaped by the council in the 1990s with rocks now covering the area of the cave / resurgence and the flow of water being directed into a culvert under the road. 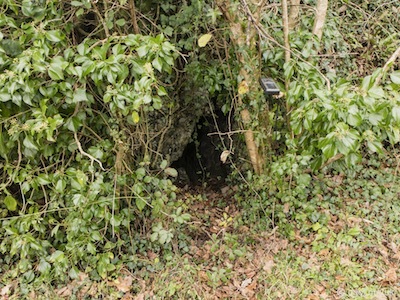 This cave is located in Bishop's Wood and found by walking up from the carpark following the main footpath through the wood. A short distance before you reach a pavilion on a major T-junction a climb up the west side of the wooded valley leads to the cave about 15 metres from the footpath. The entrance is located in a depression on a wooded slope. The cave is gated and a key held by the Bishop's Wood Countryside Centre. The entrance leads down to a point with two ways off, to the south a tight squeeze leads to a small chamber a little under 3 metres long. 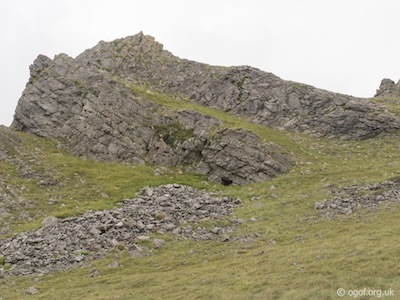 The main route is to the north, where a steeply descending rift is followed to reach a dig down through boulders. This descends for over 15 metres and is too constricted to free-climb. Gower Caving Group diggers used a winch to haul people up and down this shaft. The dig down leads to a vertical slope which opens after 7 metres in the roof of a large muddy chamber about 16 metres long long, 3 metres wide and 10 metres tall. At one end of the chamber there is a boulder choke and at the other end a short passage and a clear sump and stream which flows even in the driest summers. This has been looked at by Martyn Farr and was not dived as it would require a rock lip to be removed to allow access. After heavy rain the chamber fills completely. 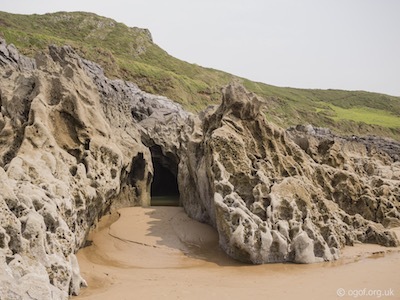 This sea cave is located in the cliffs on the east side of Caswell Bay. The cave is about 10 metres long ending in an aven. 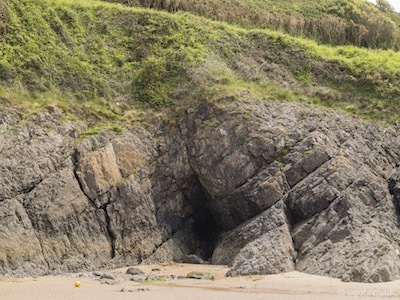 This the most prominent of the sea caves in Caswell Bay, with its tall rectangular entrance. It is located in the cliffs on the east side of the bay and can be penetrated for 10 metres. 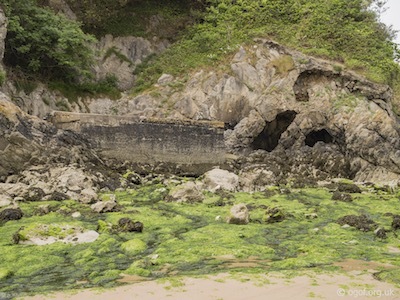 This the easternmost caves of Caswell Bay and can be entered at low tide. A gully leads to the entrance to the cave. 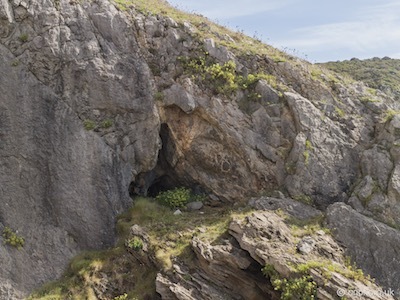 This cave is located about 150 metres west of the headland that lies on the west of Langland Bay. This is a sea cave with cemented rock roof that overhangs the entrance and has a significant dove roost. A larger sea cave lies just to the west of it. At Langland Bay, on the eastern half of the inlet, on a crag known as Rother’s Tor is the site of the Osborne Hotel, now demolished and replaced with luxury appartments retaining the name of the hotel. In 1892 during the construction of an extension to the hotel, a v-shaped cavity was discovered and partially examined by members of the Swansea Scientific Society. During excavation bones were uncovered and found to belong to a ‘cold Pleistocene fauna’ which are now held in Swansea museum. 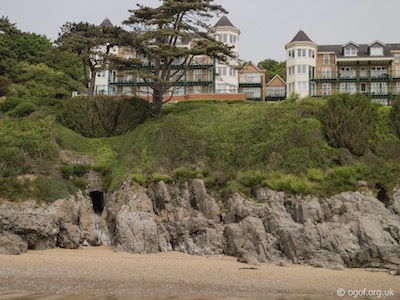 The entrance to the lower portion of the cave can be seen on the beach below the hotel and can be penetrated for about 8 metres, the passage open at the bottom but the top section of the passage filled with reinforced concrete. The sea cave is best approached from Langland Bay at low tide and is located about 600 metres to the east of the entrance to the bay. 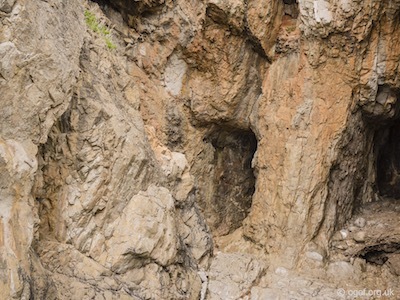 The sea cave is located at the head of a gully and about 10 metres to the west of Doctor's Mine. The cave is cobble flooored and can be followed for about 20 metres before it closes down. The mine is best approached from Langland Bay at low tide and is located about 600 metres to the east of the entrance to the bay. The sea cave is located at the head of a gully and about 10 metres to the east of the sea cave detailed above. The mine follows what appears to be a vertical vein of high iron content mineral. The tall smooth walls being covered in a red ochre-like material. The mine is probably an extension of a sea cave and can be followed for some distance into the cliffs. Lack of light prevented the author from making a full investigation of this site. 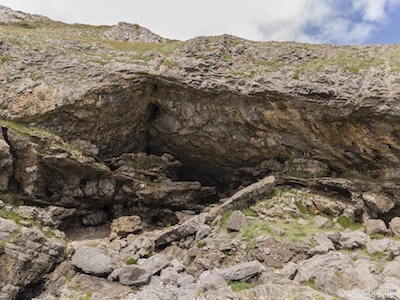 The cave is located near the top of a massive sloping bed of limestone that runs from the sea to the base of the cliff on the west side of Rams Tor. The mouth of the cave is almost invisible until within a few meters and faces the sea at the upper end of a sloping rocky shelf. It is low and narrow and almost blocked by large boulders, but entry is possible through a gap about 2 metres high. The interior consists of a long chamber measuring approximately 40 metres x 7 metres and up to 3 metres high. There are considerable stalagmite formations and the floor is to a large extent covered with loose blocks of limestone. There is no record of any excavations. 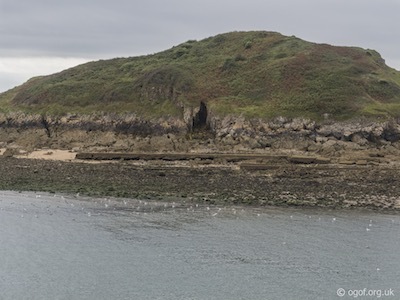 There are three sea caves located on the south side of Middle Head at Mumbles Point that can be visited at low tide. This is the cave nearest the mainland. This cave is so called because the rock formation at the entrance. This is reported as looking like an elephant’s head and trunk by Oldham, while this author thought that after enough whisky one might view a section of rock as resembling the leg of an elephant.... The cave consists of a single tall rift-like passage formed on a prominent joint which closes down after about 23 metres where the pebble floor meets the ceiling. The whole cave is flooded at high tide. 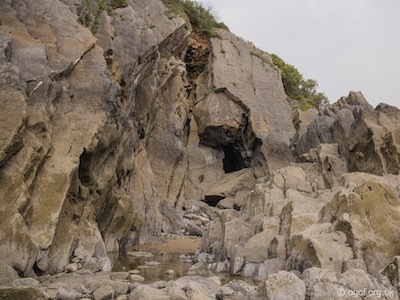 There are three sea caves located on the south side of Middle Head at Mumbles Point that can be visited at low tide. This is the middle of the three caves. Daylight Cave has an entrance 1.6 metres wide x 2 metres high. It is another single passage which goes for about 25 metres. This cave again is flooded at high tide. At the end of the passage, up on the right hand side is an aven leading to the surface on the other side of the island, but too small to get through. 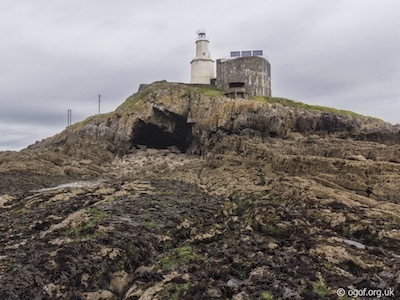 There are three sea caves located on the south side of Middle Head at Mumbles Point that can be visited at low tide. This is the outer of the three caves. Telegraph Cave has an entrance 2 metres high x 2.6 metres wide. It is quite spacious with several pools and some holes in the roof. It extends for 21 metres, terminating in a chimney which goes to the surface at the base of a telegraph pole, from which the cave takes its name. There are at least two blowholes located close to the telegraph poles at the eastern end of Middle Head. 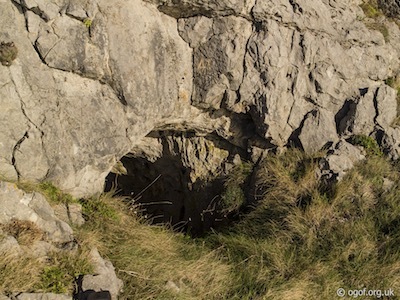 The holes are believed to connect to the end of Daylight Cave and Telegraph Cave which follow the fissures from the cliffs to the south. 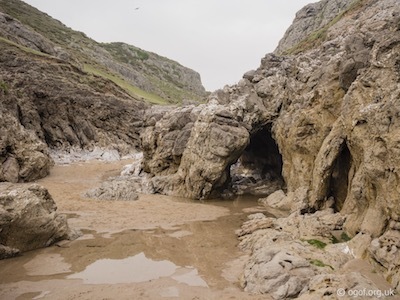 Bob’s Cave is named after a member of the Mumbles Lifeboat crew, Bob Jenkins, who was found sheltering here two days after a tragic rescue attempt in January 1883. 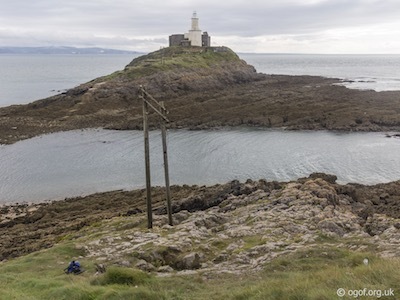 Bob’s Cave is situated beneath the lighthouse on the islet of the Mumbles Outer Head and is accessible at low tide. The entrance is huge and penetrates deep into the island. The wide flat roof gradually lowers to meed the cobble and boulder strewn floor after about 20 metres. In the back left hand corner of the main entrance chamber a rift passage can be entered that leads deeper into the island and ascends until daylight can be seen from the top of a tall rift. The cave is located in the disused Norton Quarry below the castle field, which has now been converted into a public carpark. The cave is located in the base of the quarry face at the rear of the lower section of the carpark. The 2 metre wide x 1 metre tall entrance leads directly to a chamber with several openings. Due to the proximity to the carpark the cave is full of litter, dumped rubbish and broken glass. In the centre of the chamber is a rubbish filled hole that drops to a lower passage. At the back of the chamber a route over boulders descends for 2 metres to reach a low passage that can be followed for four metres to a tight passage on the left. This leads after 3 metres into a roomy chamber with ways off to the left and to the right. To the right a dug passage leads to a squeeze over a boulder up into small chamber formed in loose rock. The route to the left of the chamber closes down after about 4 metres. The cave was dug by the Taylors in 1950. 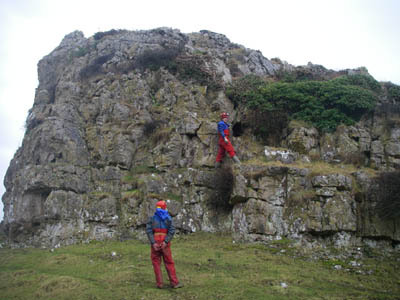 The photographs and information of this page has been provided to help cavers planning trips. Caving can be a dangerous activity, if you are interested in exploring caves please join a caving club so you can enjoy a safe introduction to this sport. 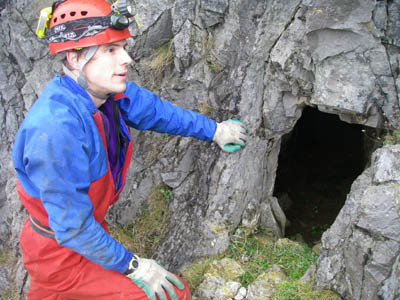 Local caving clubs are listed on the links page or you can visit the 'New To Caving' website for more options. If you feel that any of the information is incorrect or should be updated please contact us.